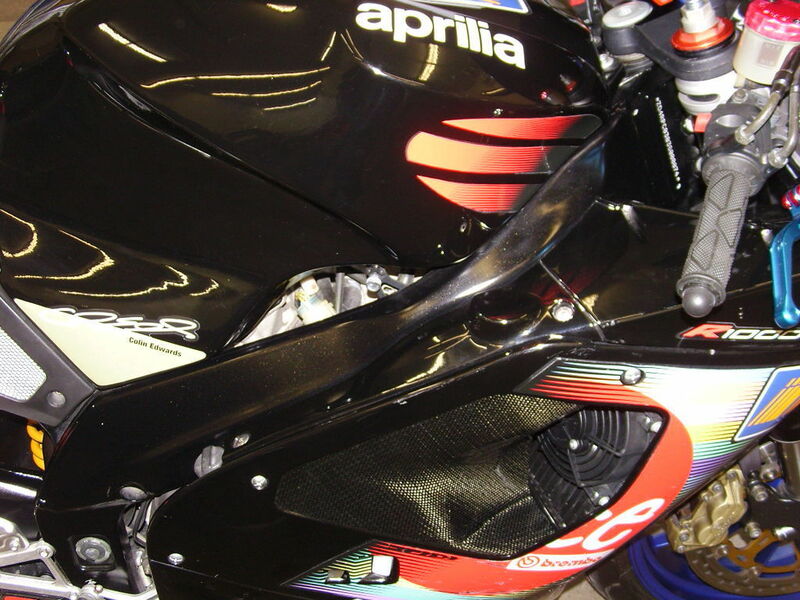 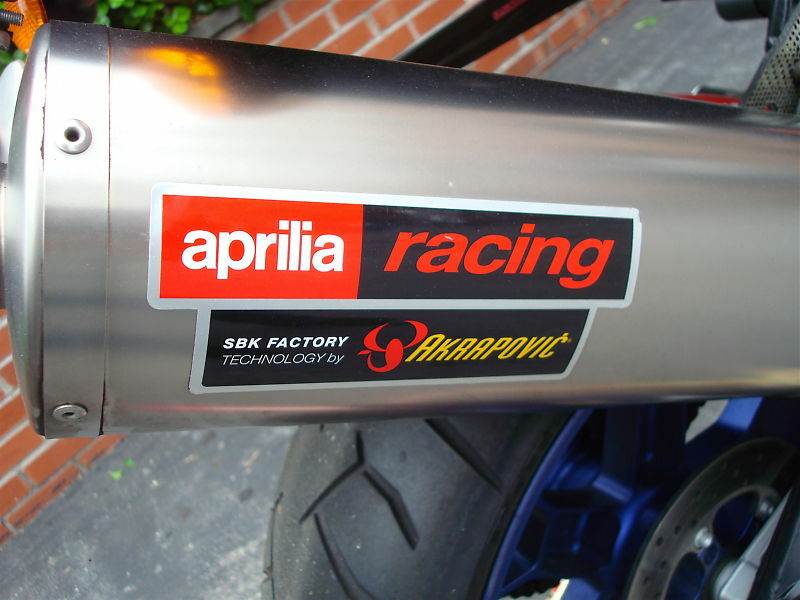 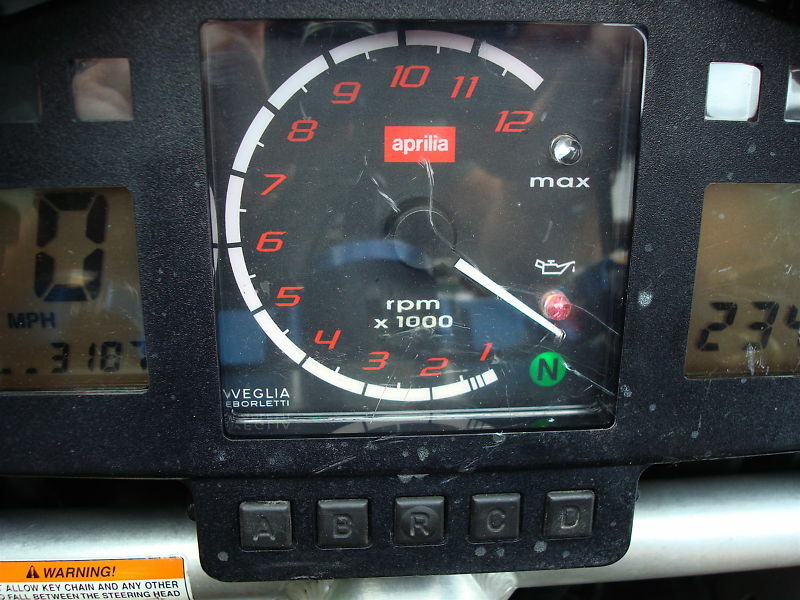 After great success racing the smaller displacement classes in Moto GP, Aprilia developed a World Superbike machine and produced the RSV Mille road bike from 1998 through 2003. 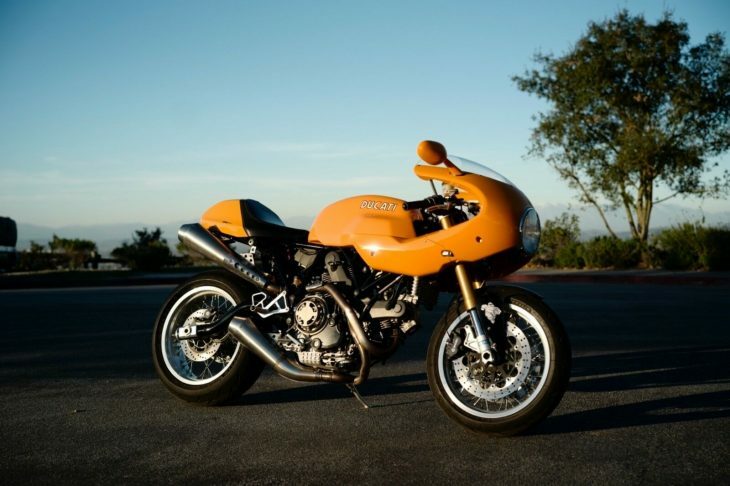 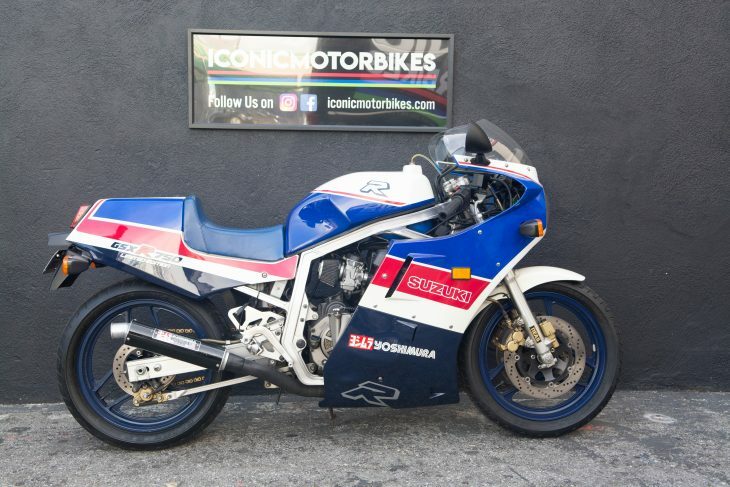 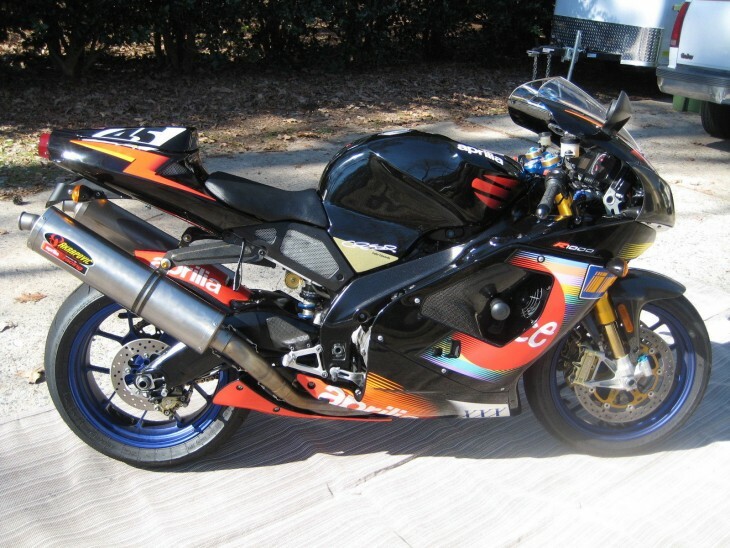 Except for the SP ( Sport Production ) 1999 homologation special which used a Cosworth-developed high revving engine, the R model is the ultimate, and this Colin Edwards Edition with livery from the RS Cube race bike, is from the last year of production and very rare indeed. 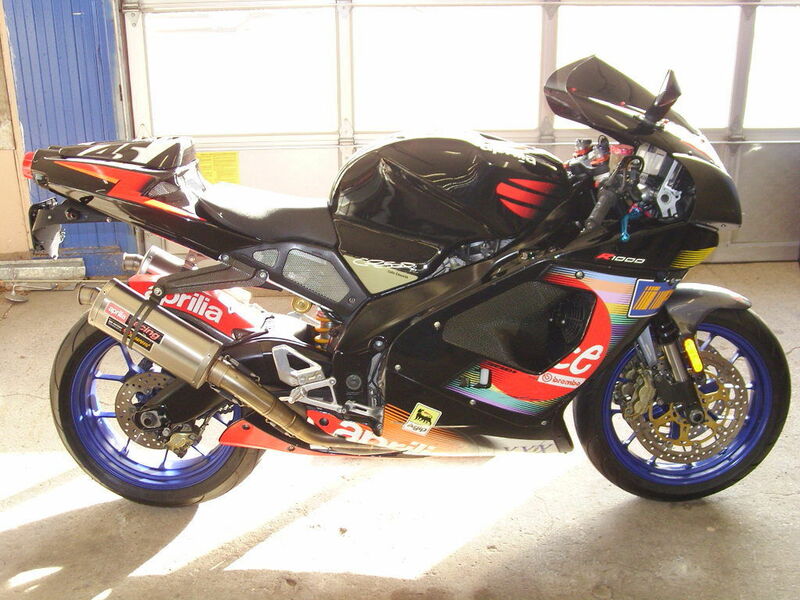 With a 997cc v-twin from Rotax, the booming RSV-Mille has 137hp, a wide torque band, and a 172mph top speed. 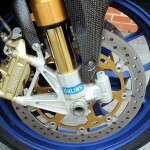 The R-model has fully-adjustable Ohlins front and rear, O-Z forged wheels, and Brembo disks, 320mm front and 220mm rear. 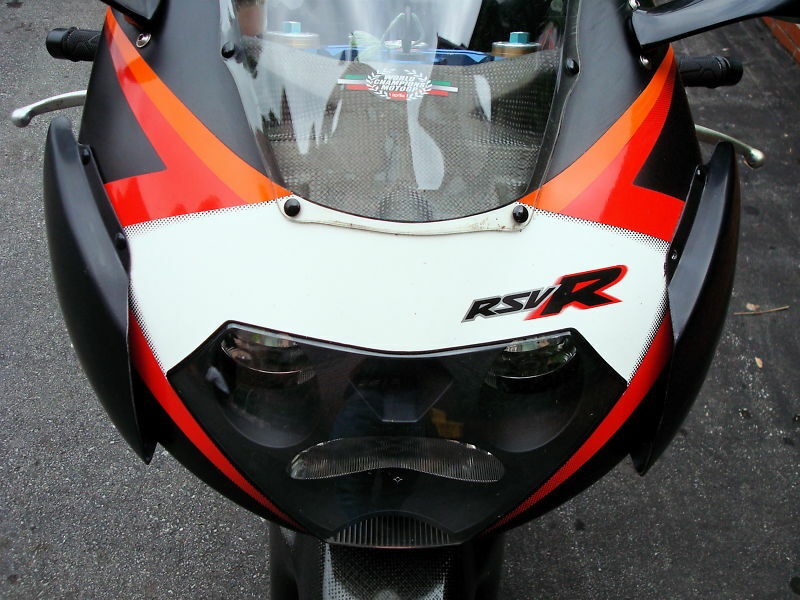 Somewhat lighter than the base RSV at 416 lbs dry, the R model has carbon fiber front fender, air scoops, heel guards, and muffler stays. 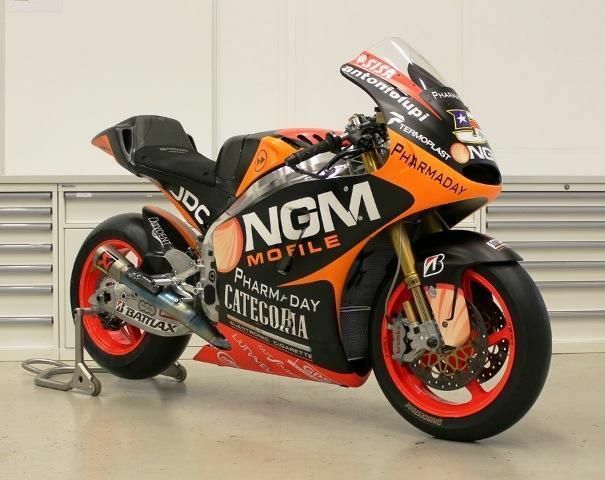 In addition to the race-replica paint, the Colin Edwards Edition has a ram-air carbon filter housing and Akrapovic exhaust. 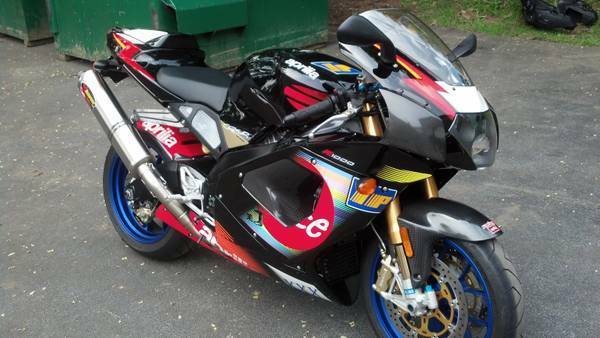 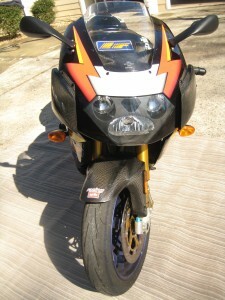 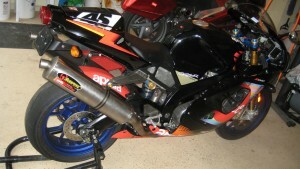 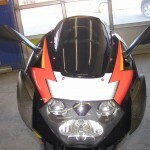 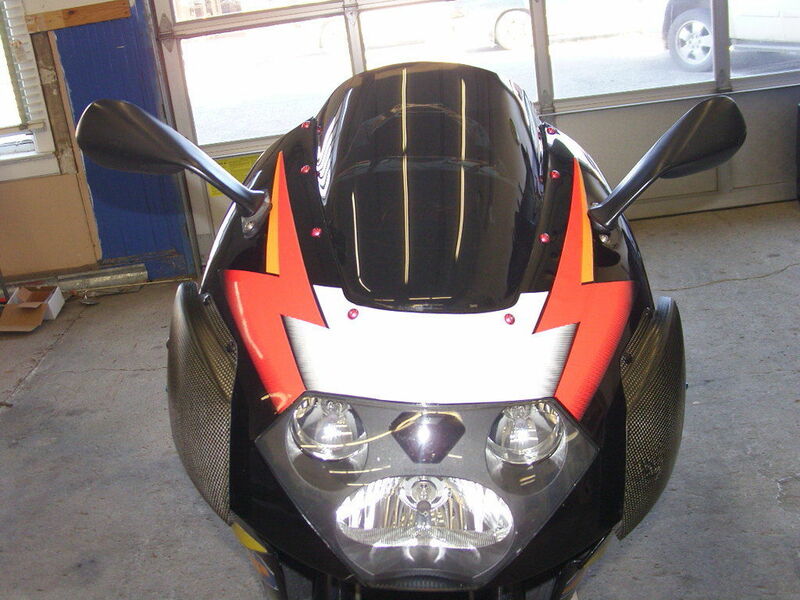 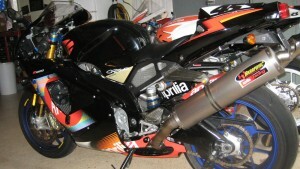 Selling this one of a kind Edwards edition with the original Aprilia race accessories carbon fiber air box. 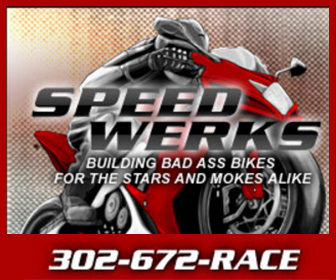 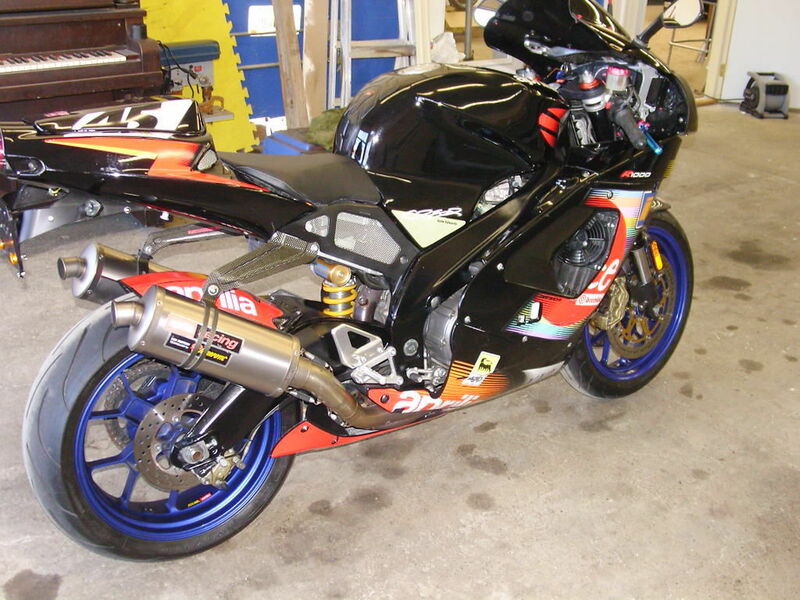 This bike is strong running and tuned making 127 hp to the rear wheel. 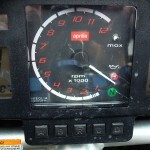 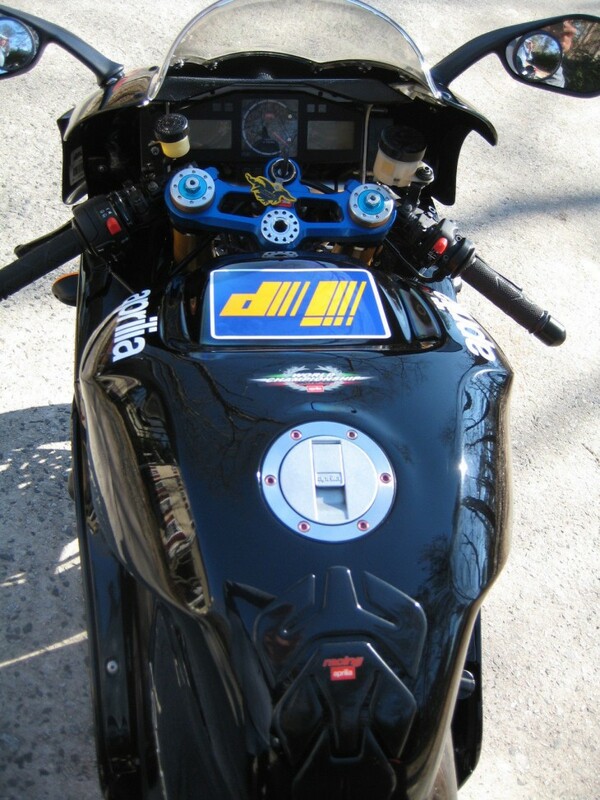 The motor is perfect, low miles, shifts and runs perfect, sound is amazing with this airbox. 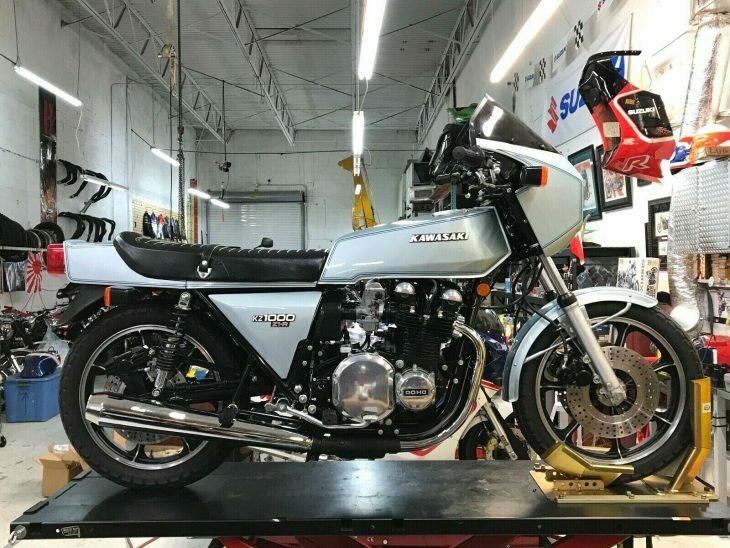 All service has been done. 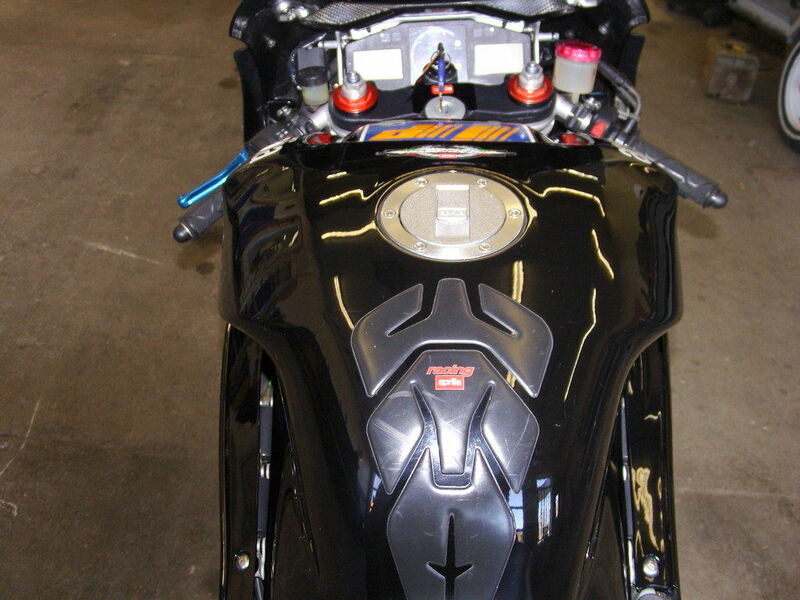 The bike just had valves checked and the cams have degreed for max efficiency of torque and hp peak. 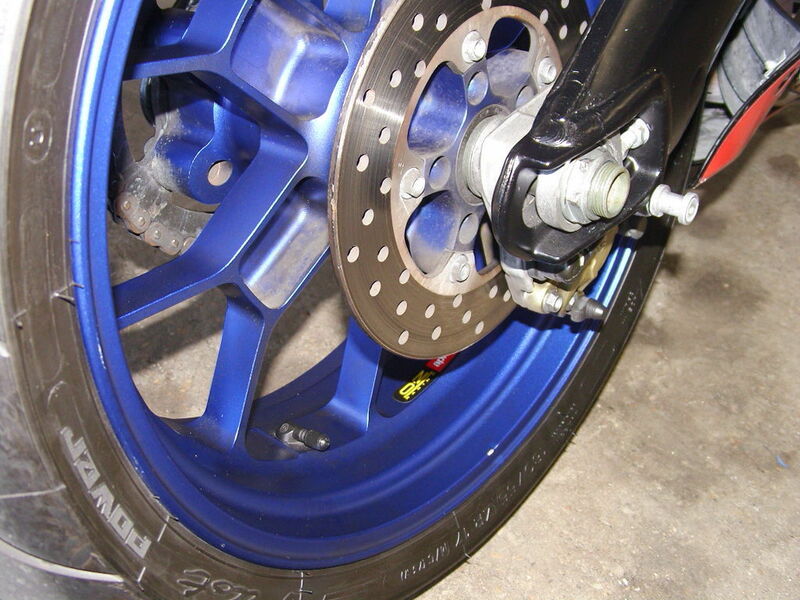 The forks have been recently serviced as well as the brakes. 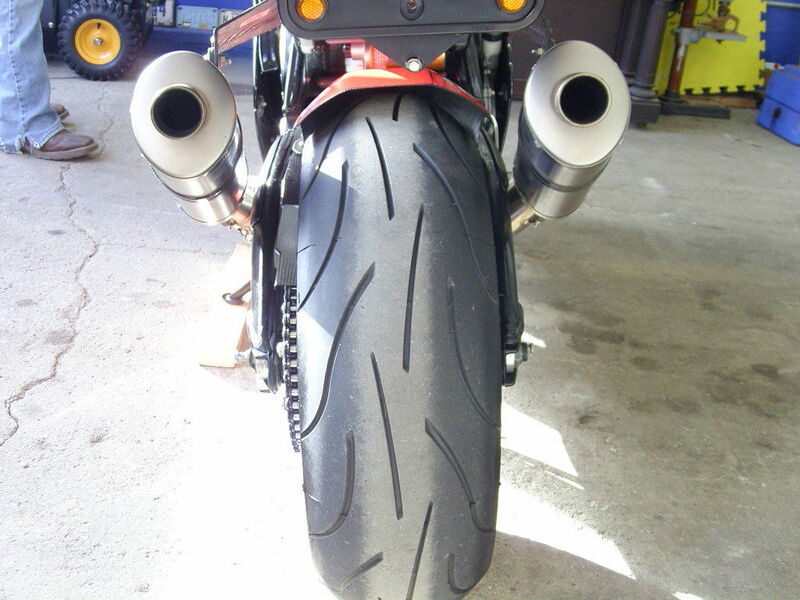 Tires are barely used Dunlop Sportmax GP-A's. 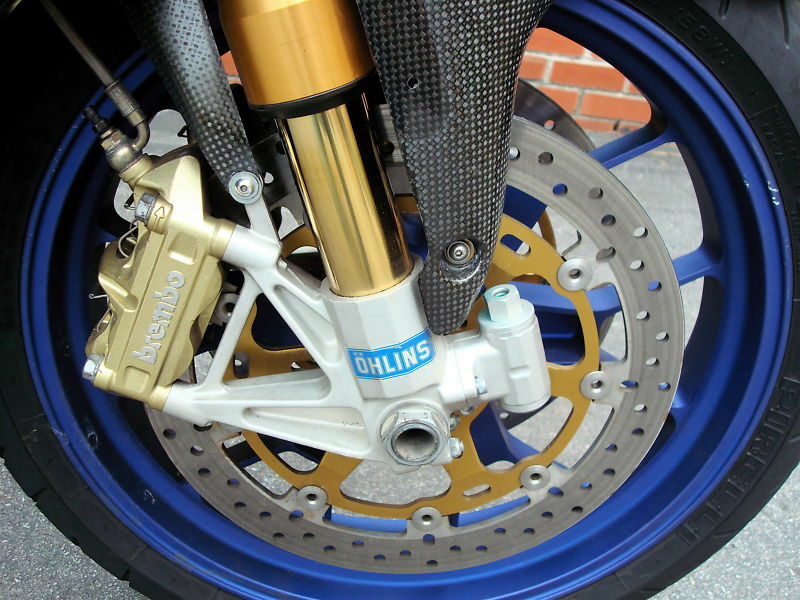 The forks have the Ohlins SS valving kit installed and the bike is sprung for a 180 - 220 suited rider and have the original springs as well. 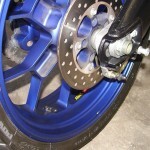 Chain is a perfect Ek MVXZ 520 16/44 aluminum rear sprocket. 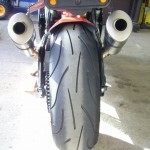 Forward frame sliders are installed. 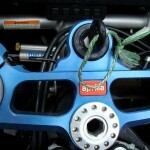 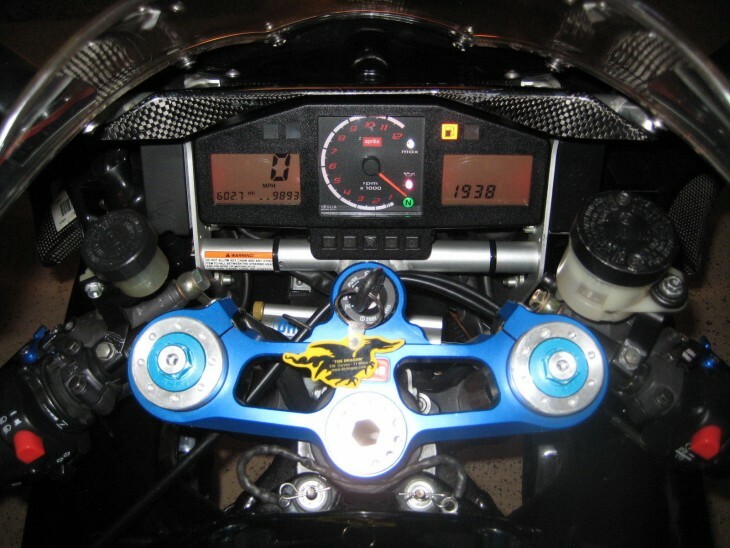 Billet shorty brake and clutch levers are installed. 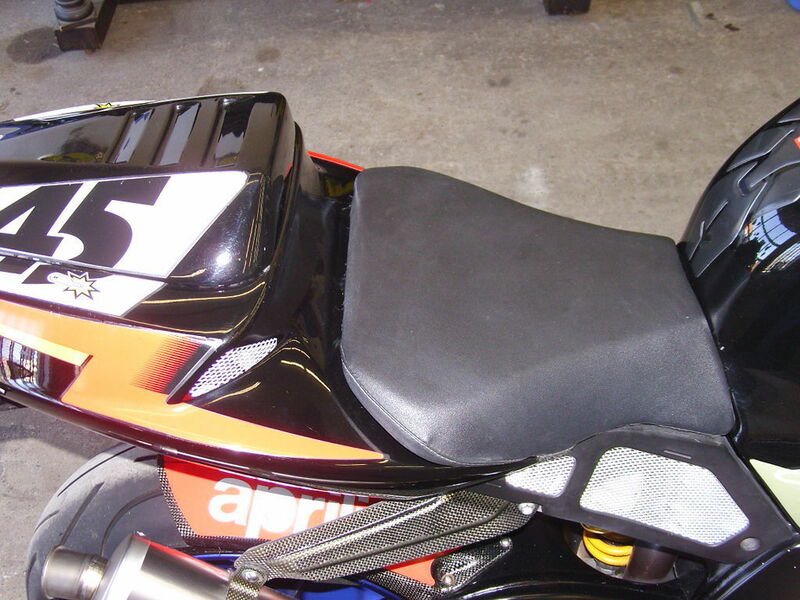 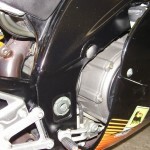 Air box has always had a custom oiled foam intake filter installed. 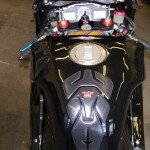 Gabro custom chip installed. 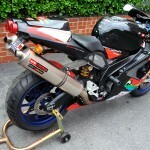 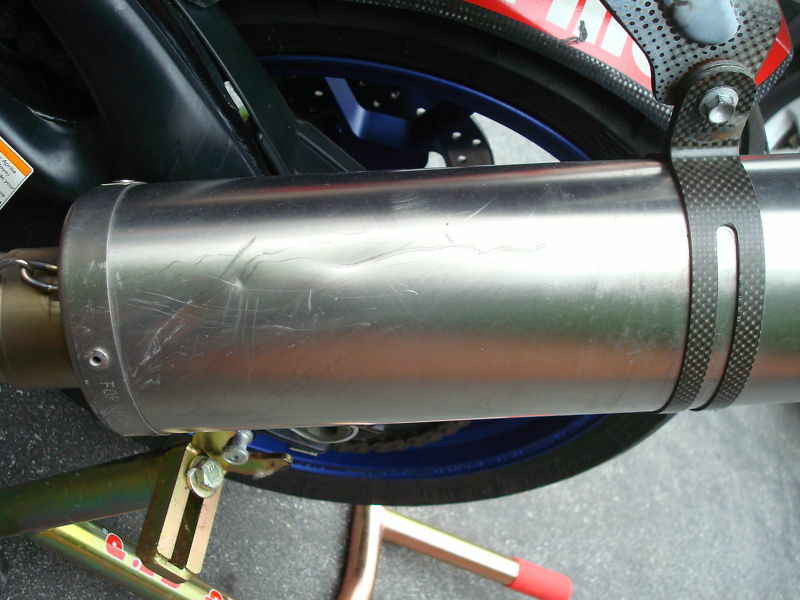 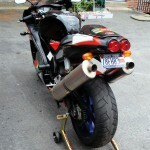 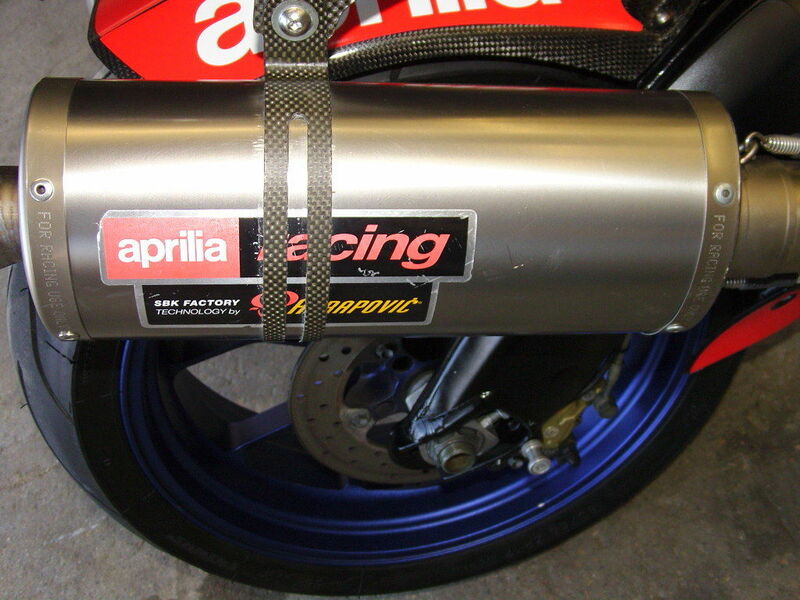 Full system Akrapovic exhaust as sold with Edwards Edition. 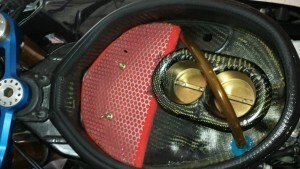 The inside of the tank is seal with Casewell tank sealer to prevent ethanol damage. 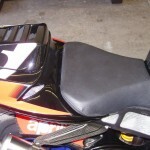 The seat is custom formed I also will include a NEW front seat. 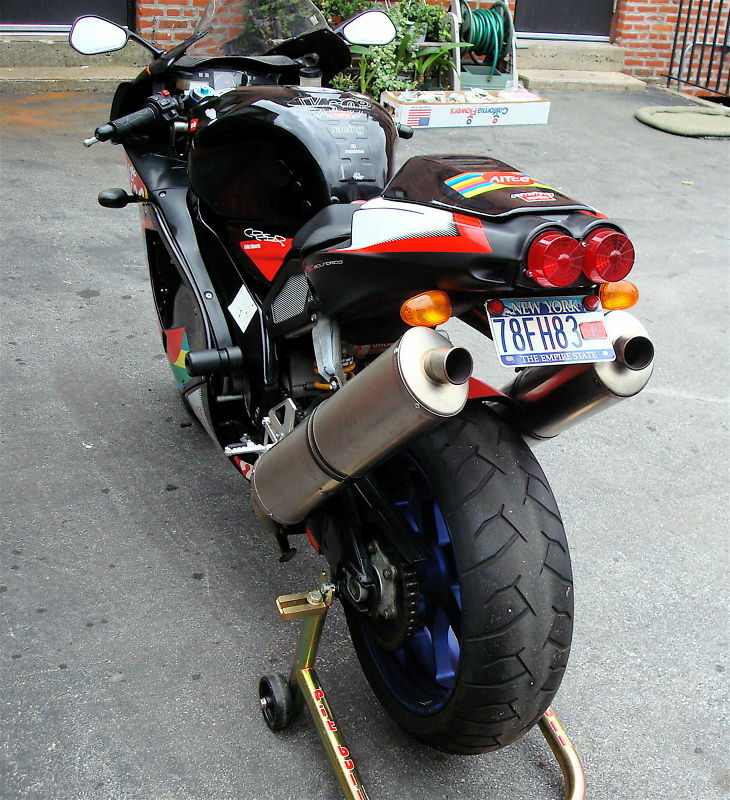 The bike has never been down starts right up cold every time and has no stumbles or hesitations. 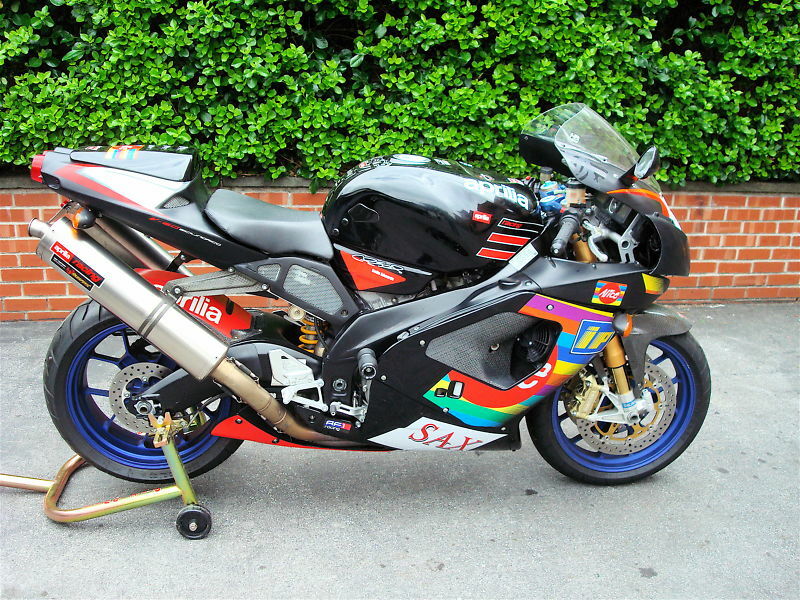 Bid with confidence on this rare one of kind Mille you can own AND ride! 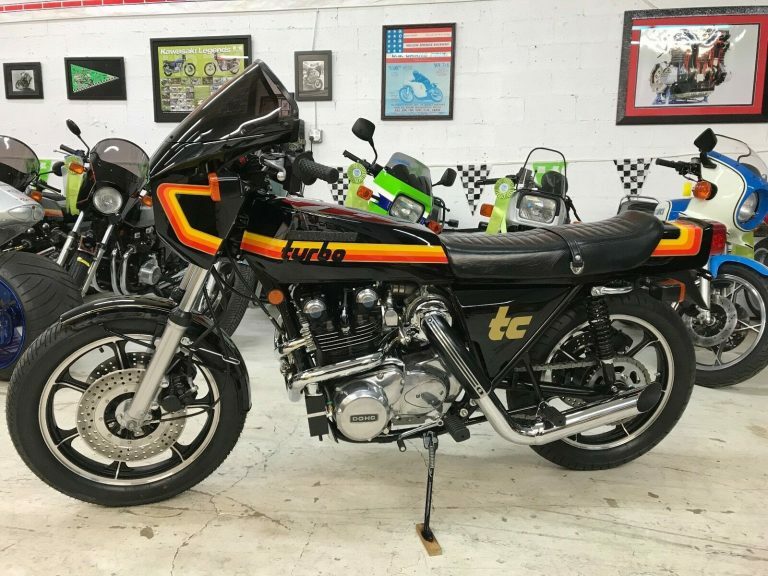 Not much time left on this auction, and the buy-it-now has an uncommon down-to-earth appearance. 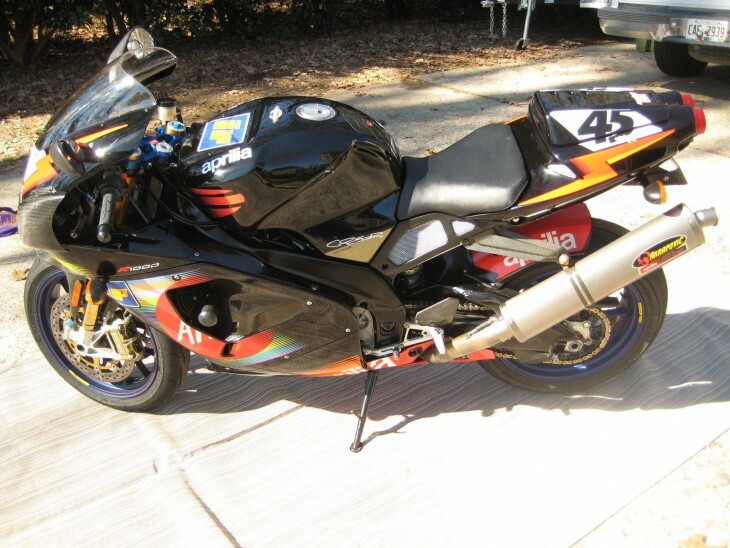 Time to do some homework and maybe plan a trip to Georgia ! 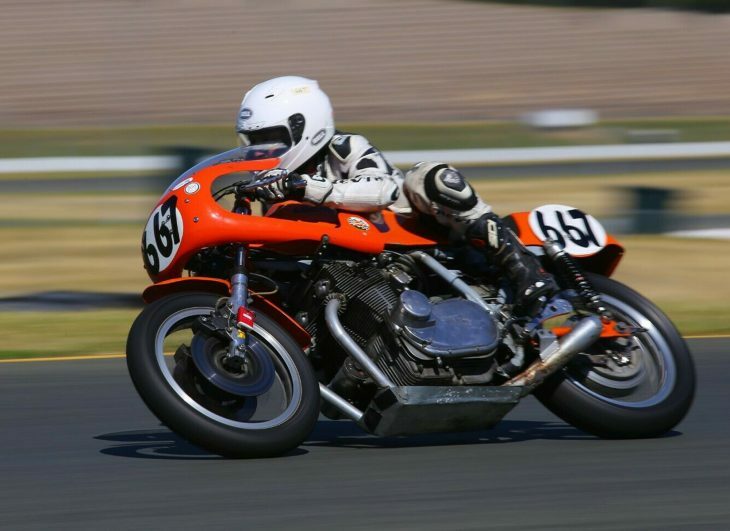 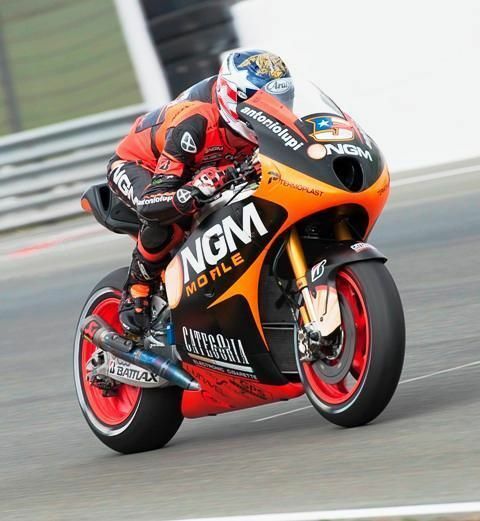 Here's a unique opportunity to purchase a MotoGP bike ridden by Colin Edwards just last year. 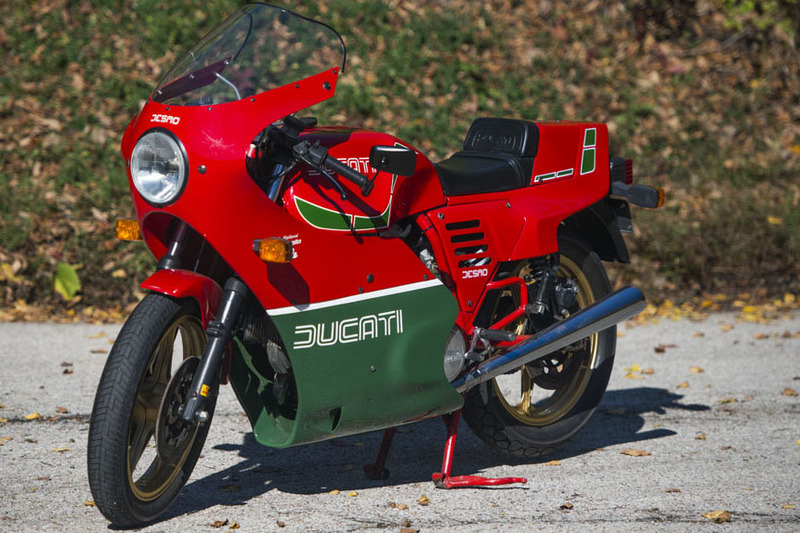 While obviously destined for a collection, I can't help but fantasize what it would be like to show up at your track day with this! 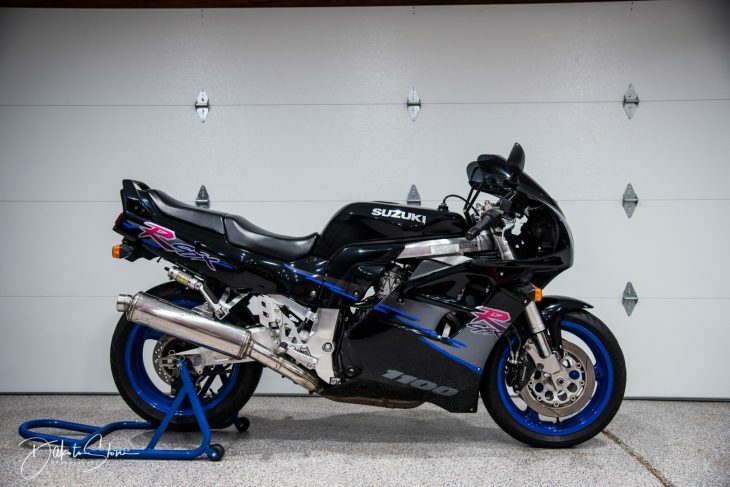 With 345lbs and 245hp on tap, you'd have to ride it at least once right? 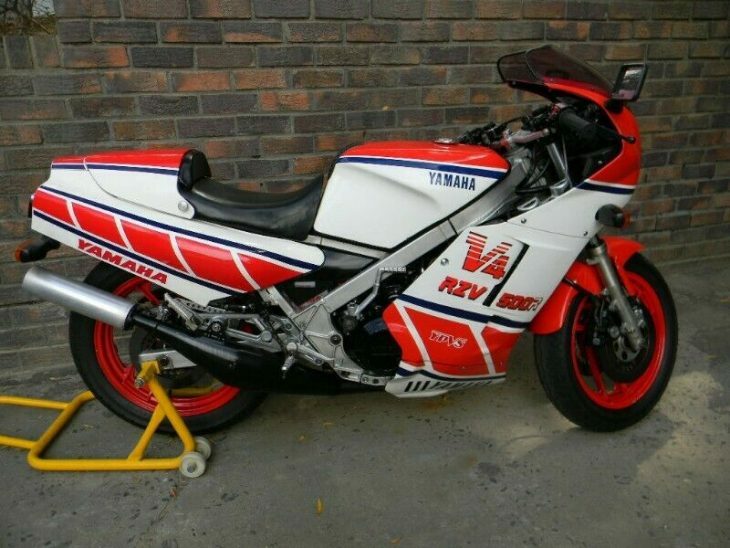 This listing on eBay UK is actual an advertisement for the Historics at Brooklands auction coming up on June 7th. 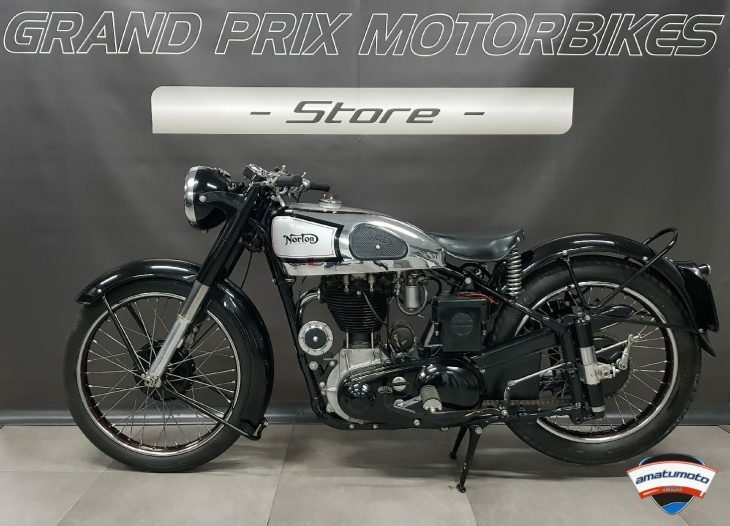 The ad states the £62,000 ($103,620) price listed with the ad is to be used as a guide. 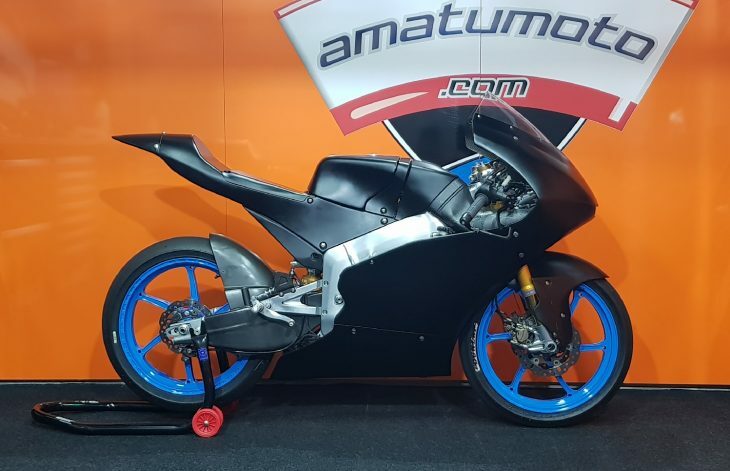 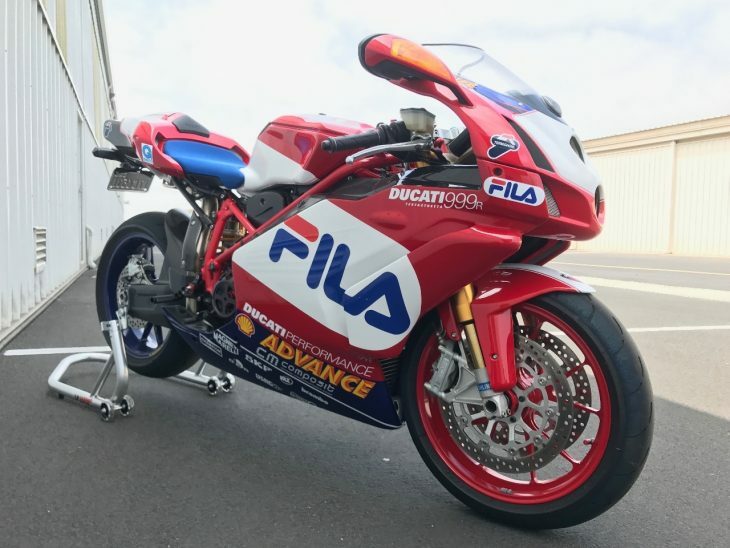 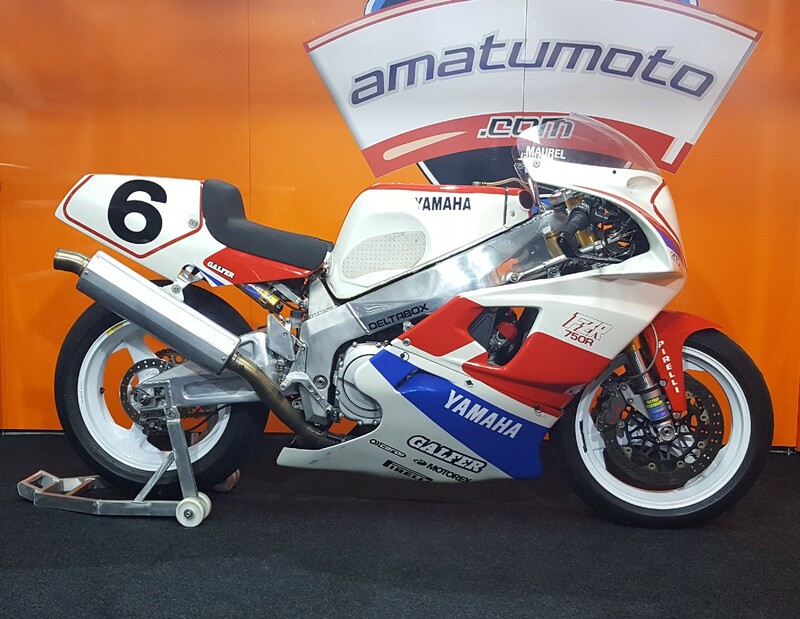 This is a rare opportunity to acquire one or both of the Forward FTR MotoGP machines with one having been ridden by two times World Superbike Champion, Colin Edwards and the other ridden by the 2008 Superbike runner up, Claudio Corti. 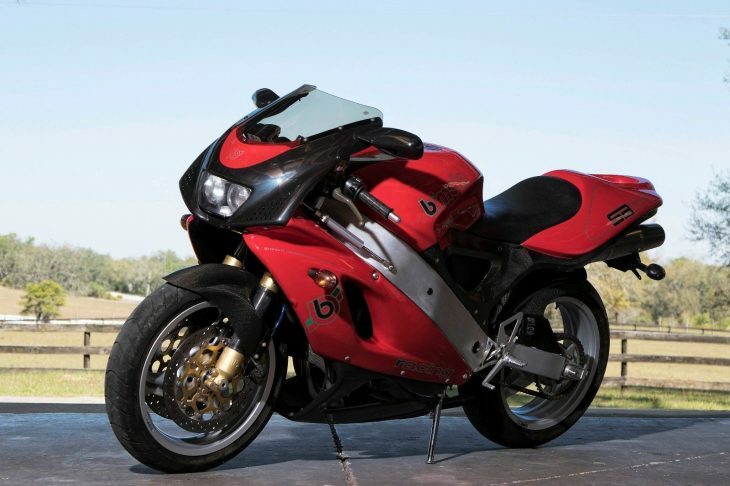 Both machines are offered with their Kawasaki ZX-10R engines tuned by Kawasaki's French based tuning company partner, Akira. 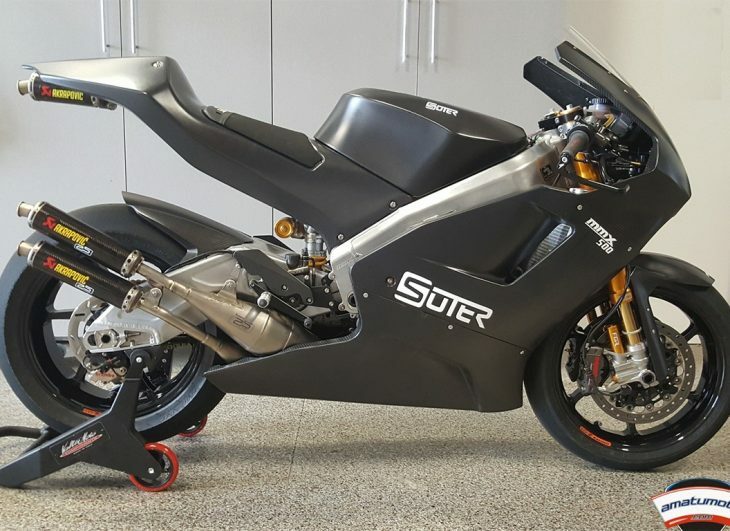 With the power output and dry weight of only 157kg and 245+ bhp of available power, these machines are capable of speeds in excess of 325 kph. 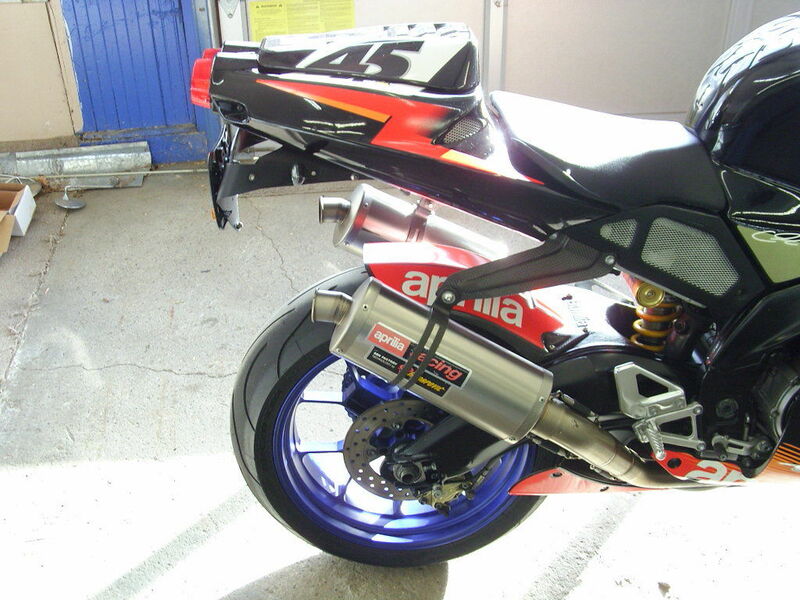 An FTR MGP13 aluminium tri-spar chassis provides the framework with Öhlines suspension, Brembo brakes and an Akrapovic exhaust system mated to the Kawasaki power plants. 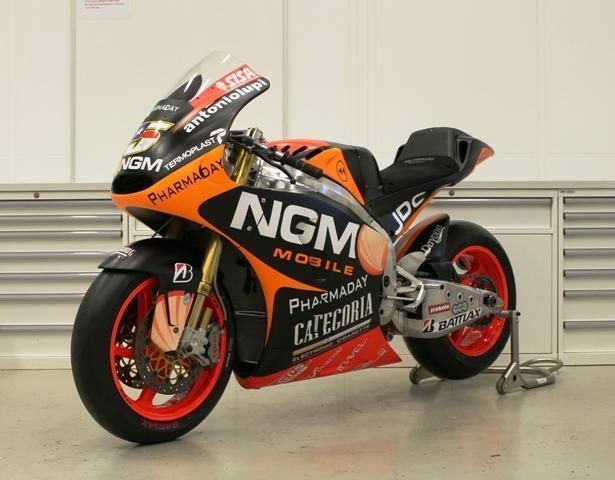 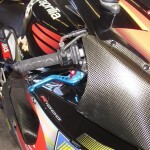 "FTR technical support post sale will include a test run of the machine with a grand prix technician to ensure the customer is fully briefed with the workings of the machinery and also two VIP paddock passes for the British round of the 2014 MotoGP World Championship at Silverstone on August 29-31 and hospitality with the NGM Forward Racing Team." 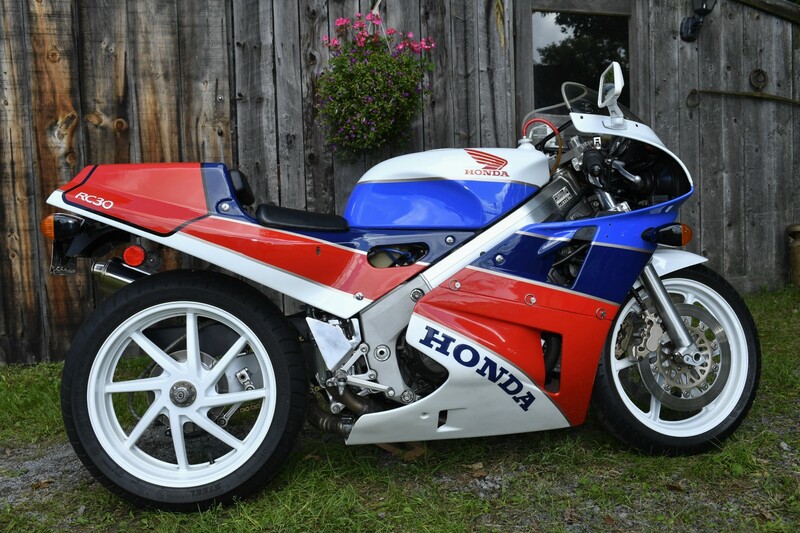 While we usually regard the early RSV Mille R as the best bargain out there right now, this Edwards edition with just 378 miles is the exception. 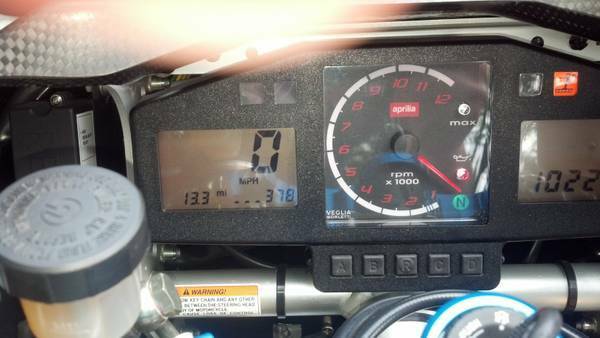 These are very rare with just 461 made worldwide and I don't think we've seen one with yet with this kind of mileage. 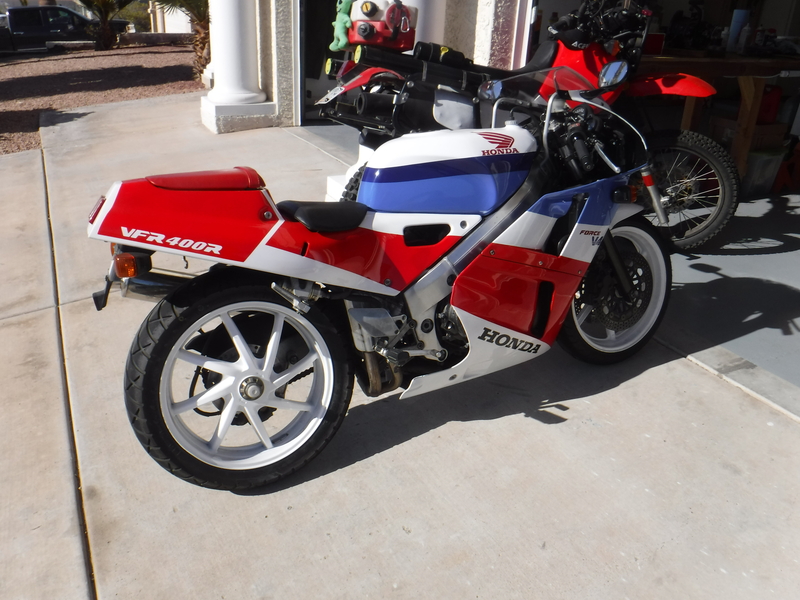 The seller has the listing set up as a buy-it-now of $9500 or best offer. 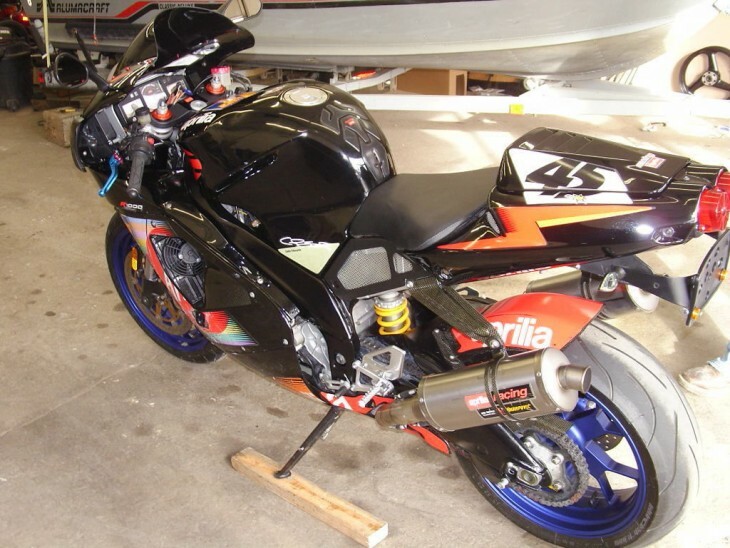 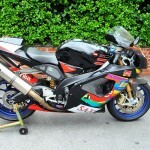 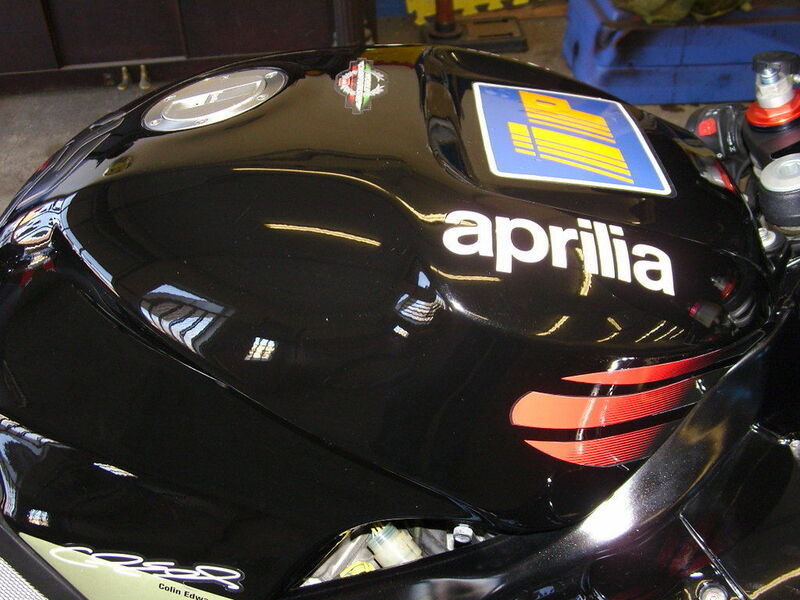 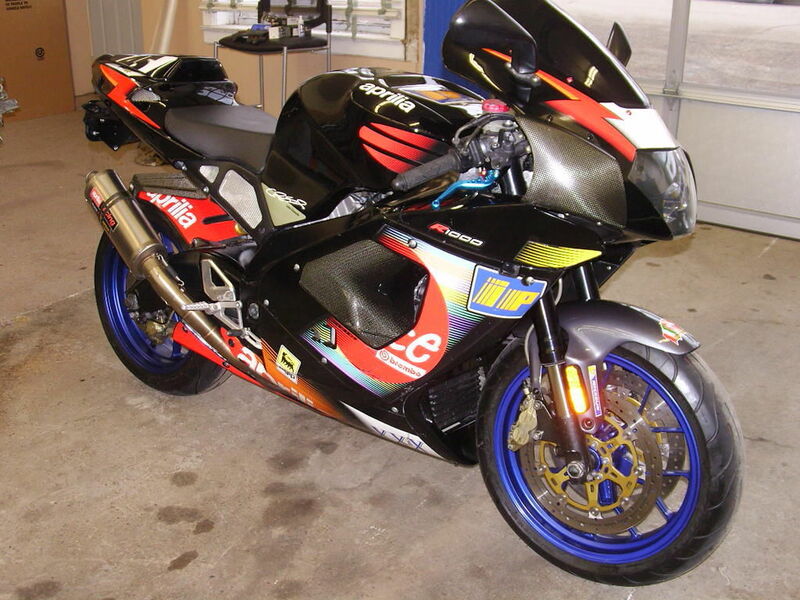 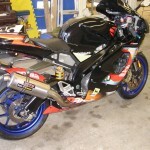 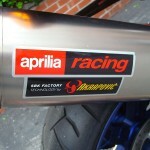 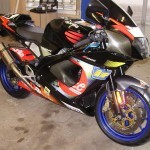 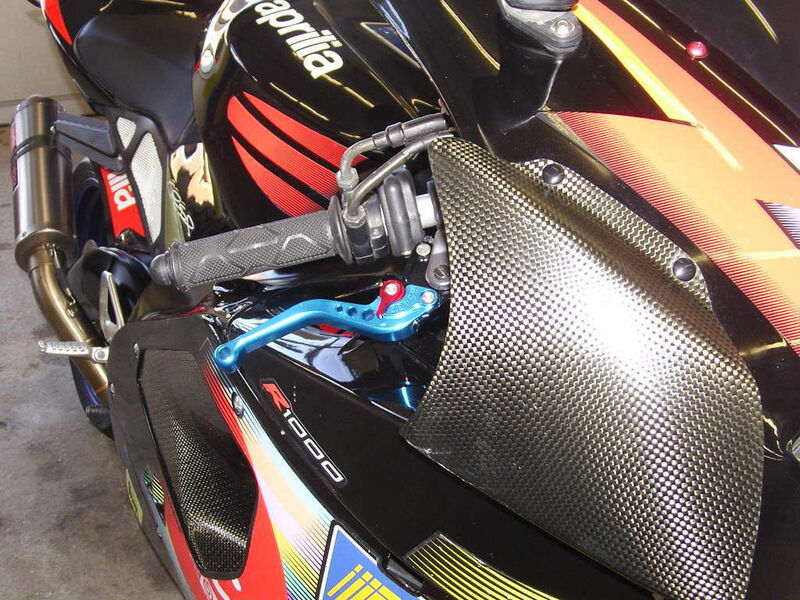 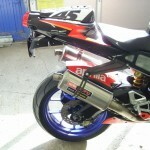 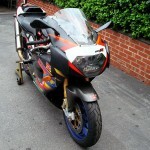 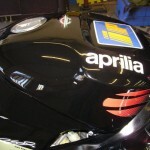 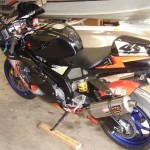 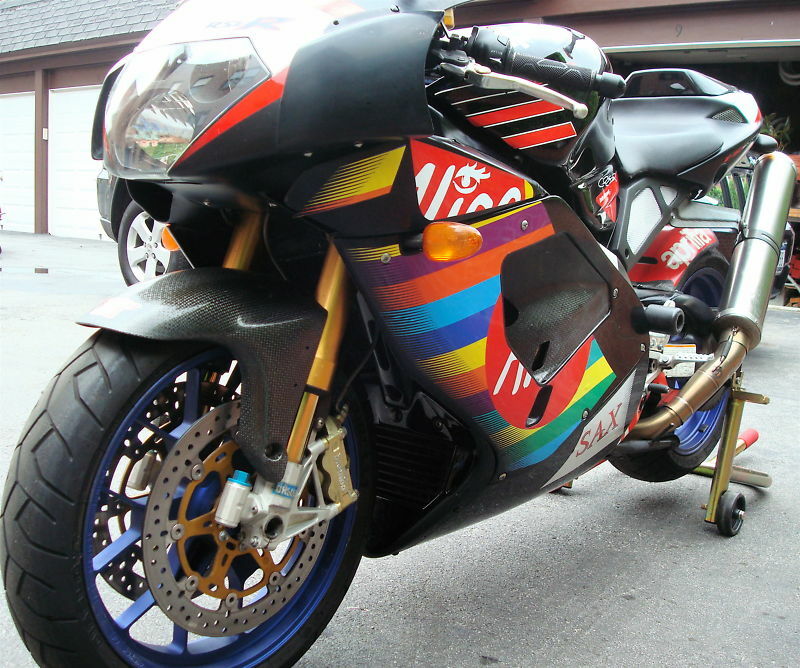 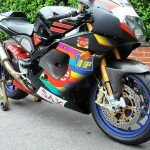 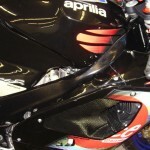 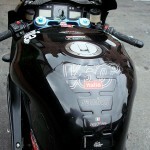 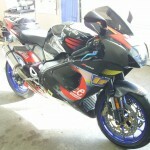 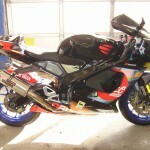 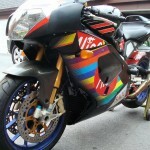 2003 Aprilia RSV Mille R 1000cc, Race Spec, Colin Edwards Replica Edition. 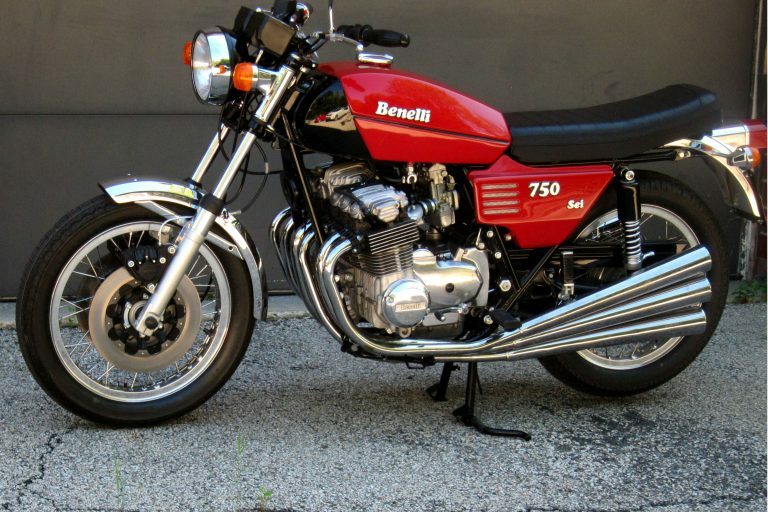 Only 50 of this edition were imported, 461 were made worldwide, this is #50. 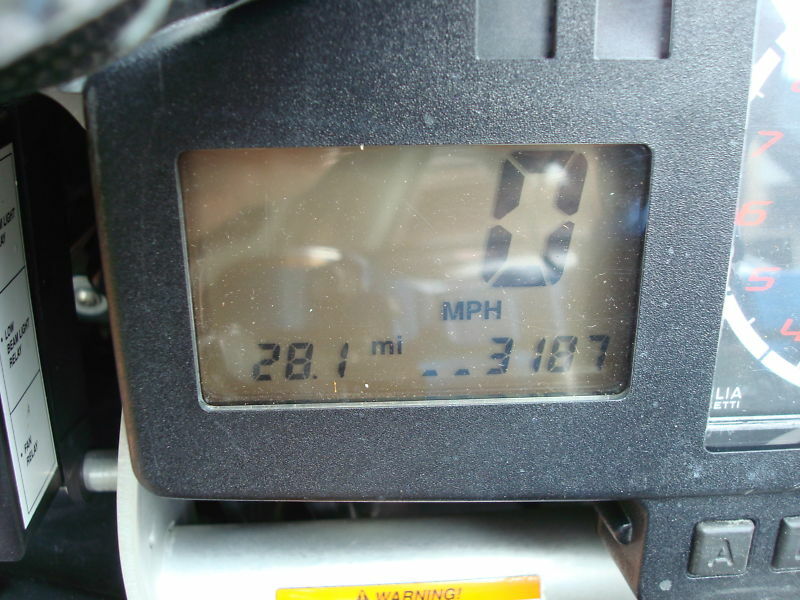 ONLY 378 Miles! 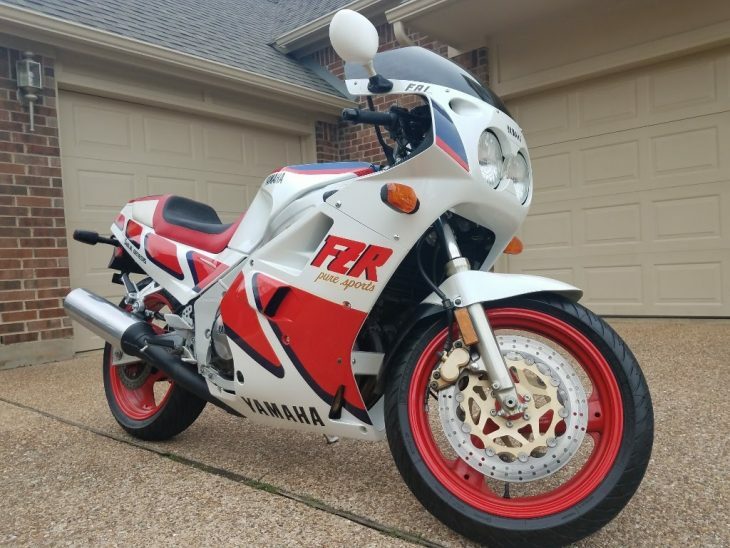 Very Clean bike! 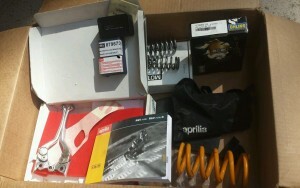 Tons of Accessories came factory for this bike. 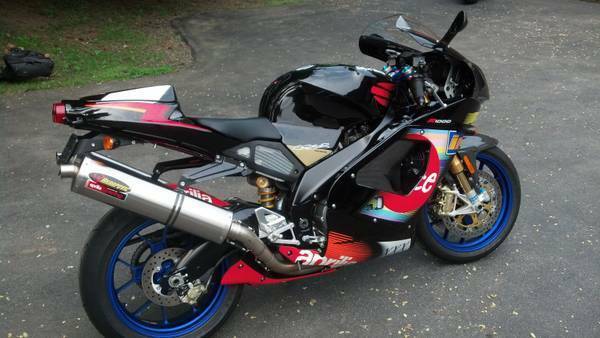 Race Spec. 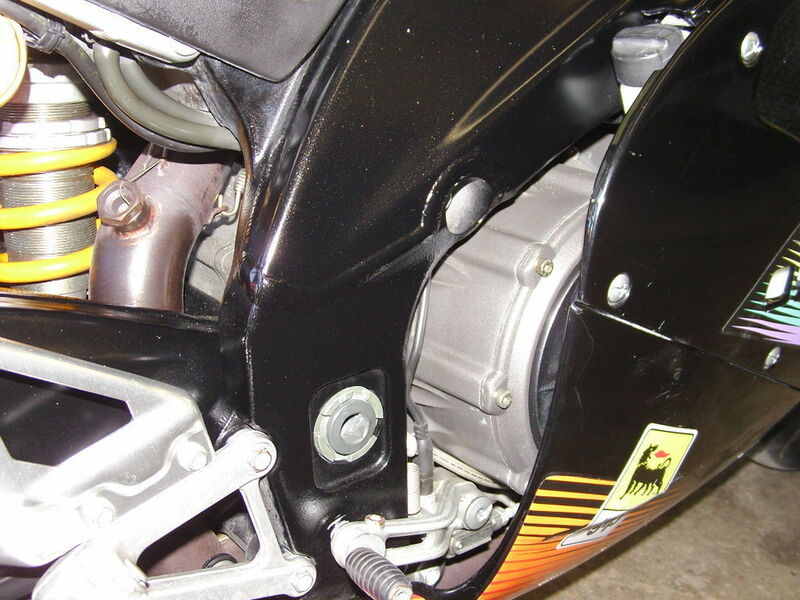 engine work from factory, O.Z. 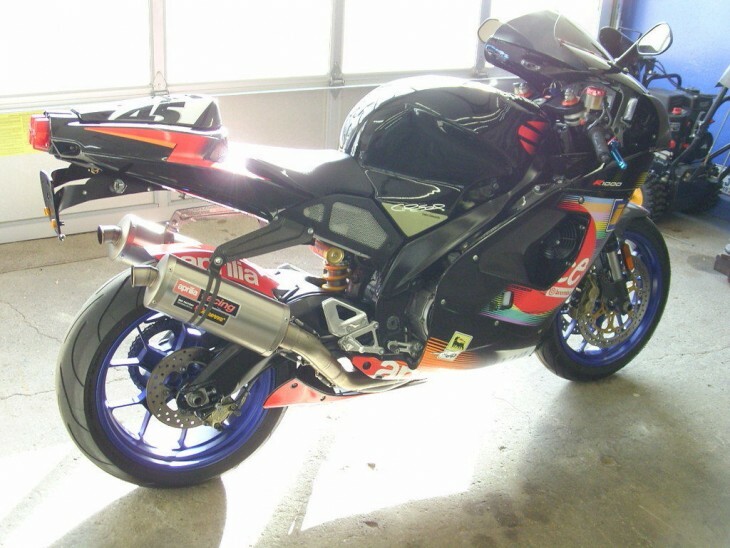 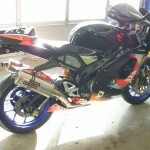 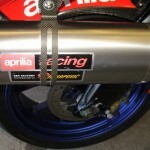 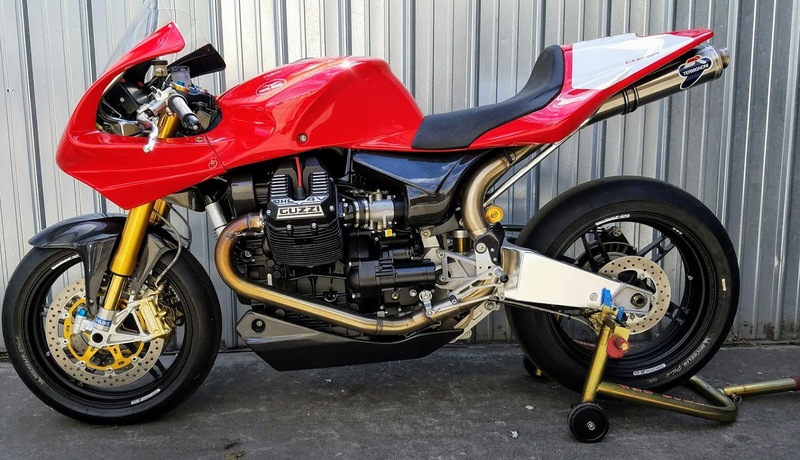 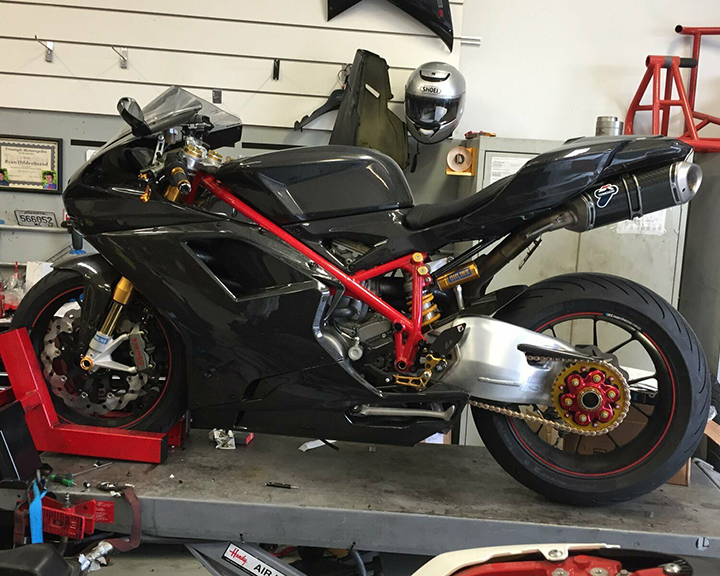 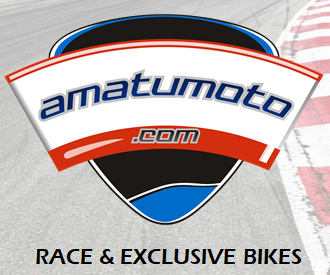 Racing magnesium wheels, Akrapovic Exhaust, Tons of Carbon Fiber, Ohlins Race suspension, Brembro Brakes and more! 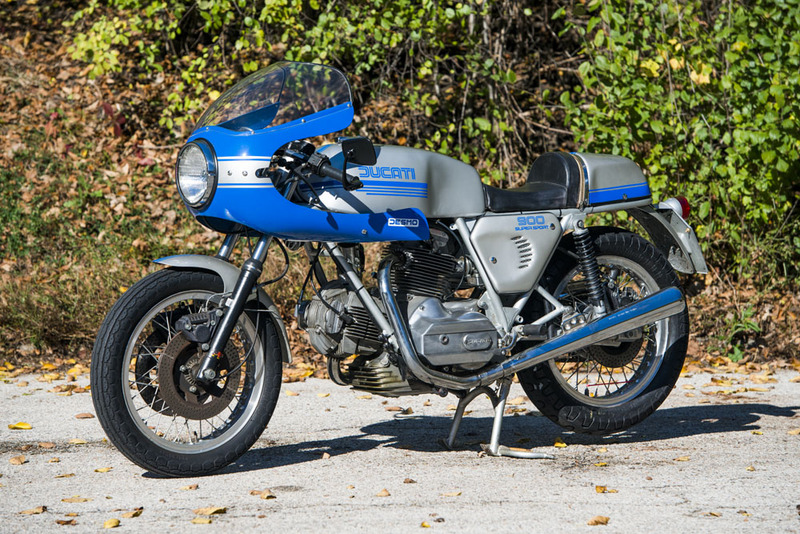 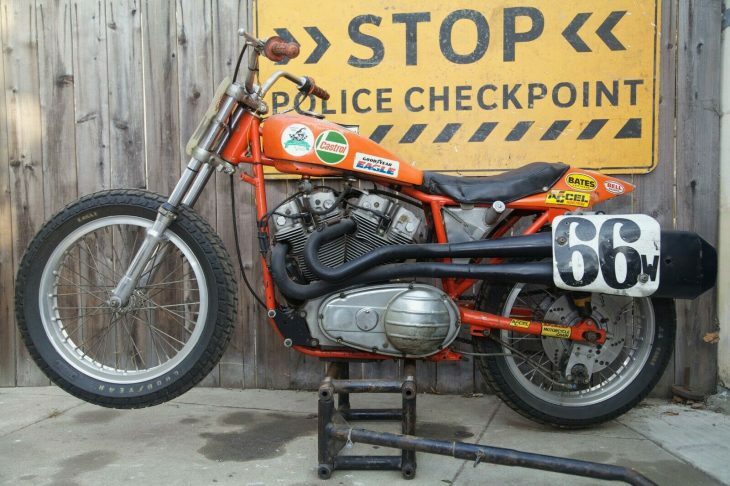 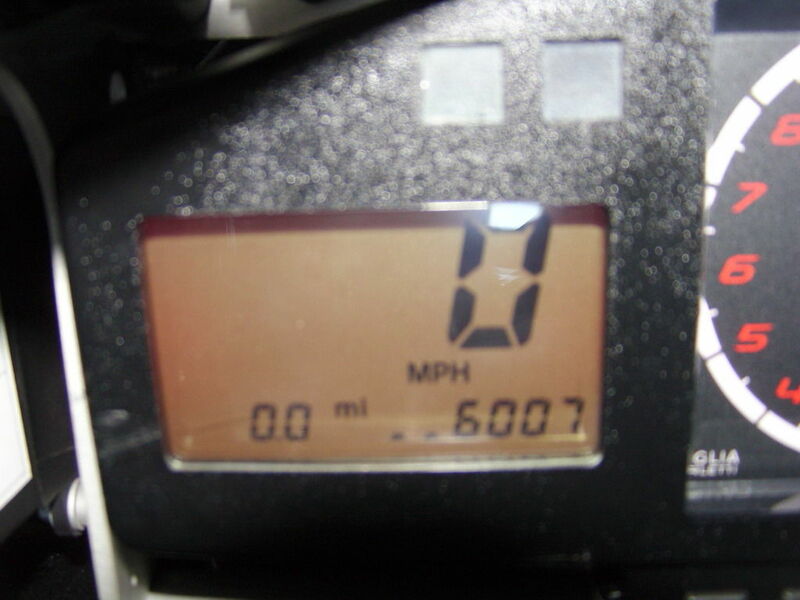 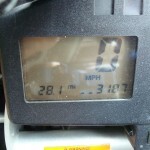 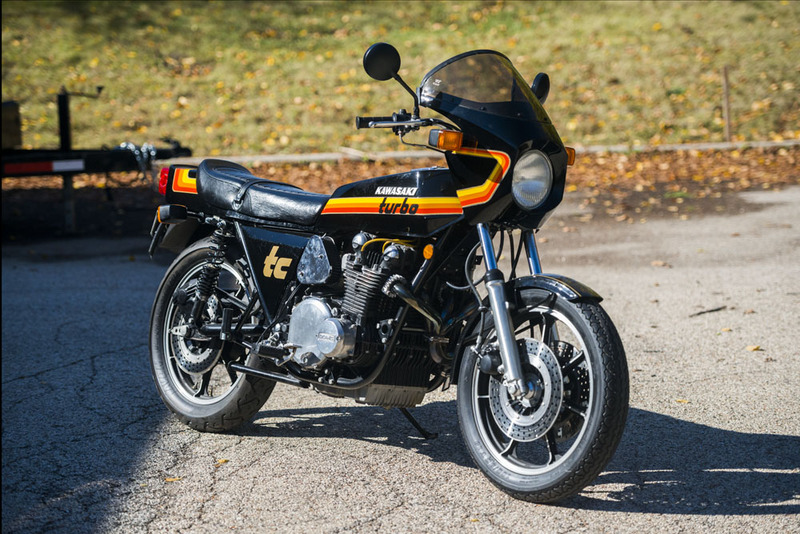 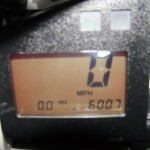 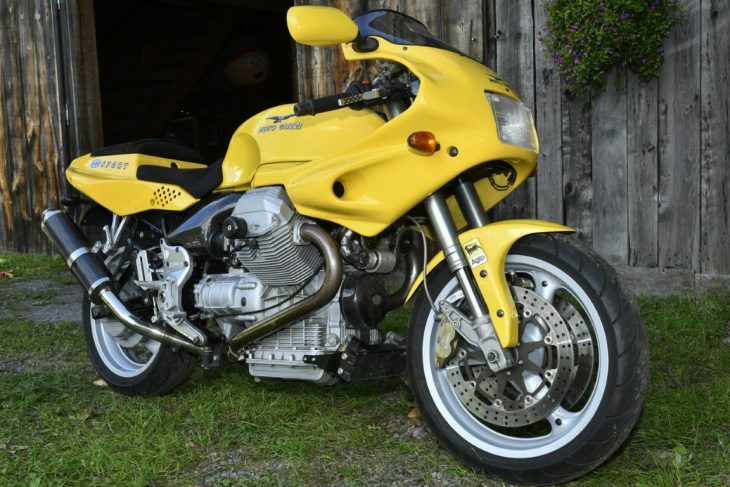 This bike is out of a collection with only 378 miles! 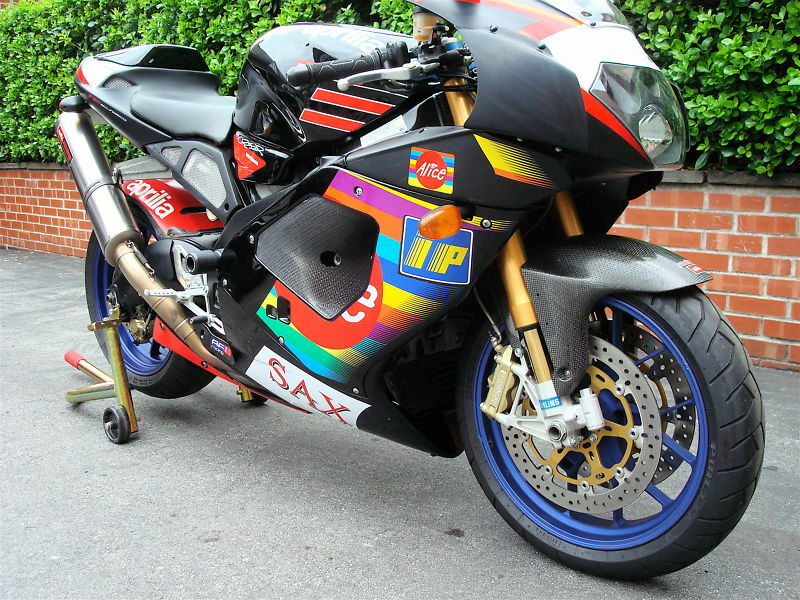 You will not find a cleaner one of these bikes on the market, this has never been raced or abused! 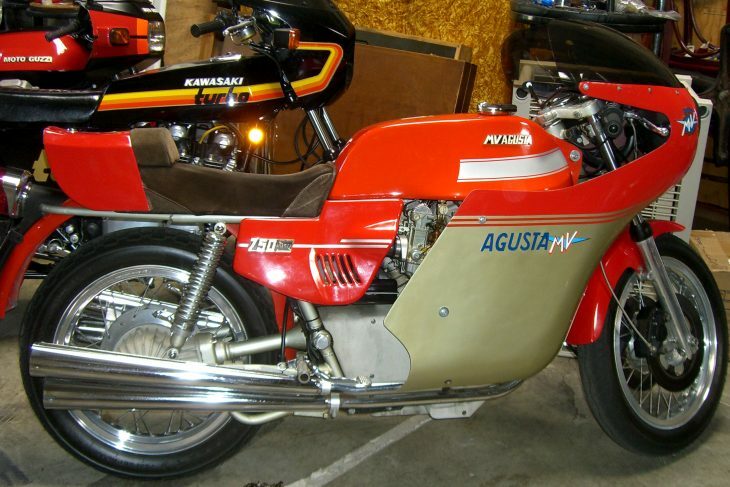 Now here we do have a nice rare bike with 461 produced worldwide. 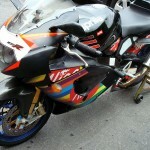 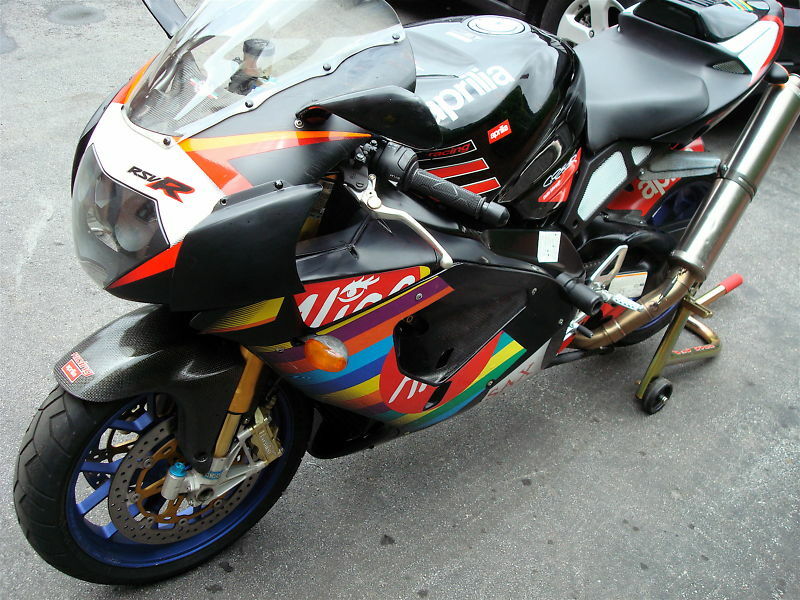 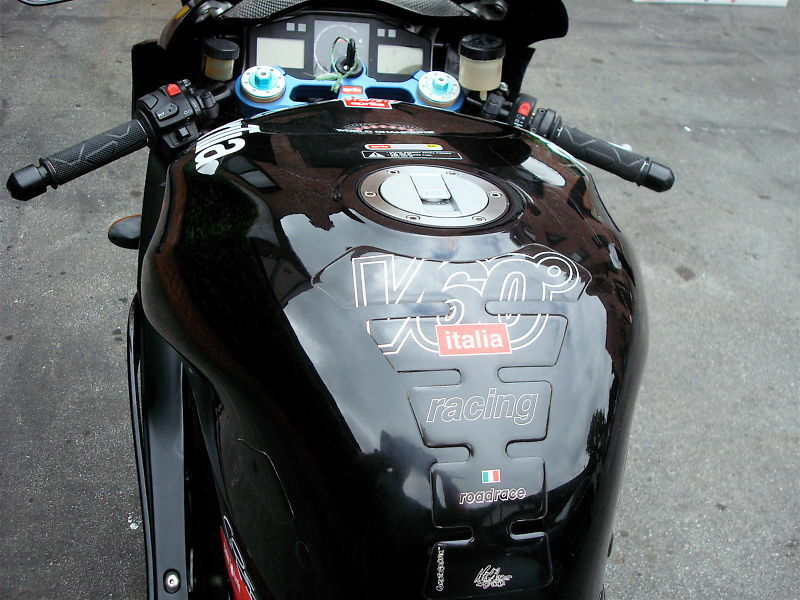 In 2003, Aprilia produced an RSV Mille R Edwards Replica with a livery inspired by the Aprilia RS3 Cube MotoGP motorcycle riden by Colin Edwards, as with the Haga replica from 2002, the motorcycle came with a circuit kit, which included Akrapovic exhausts, a more pressurised airbox, an Eprom injection unit and 57 mm (instead of 51 mm) throttle bodies. 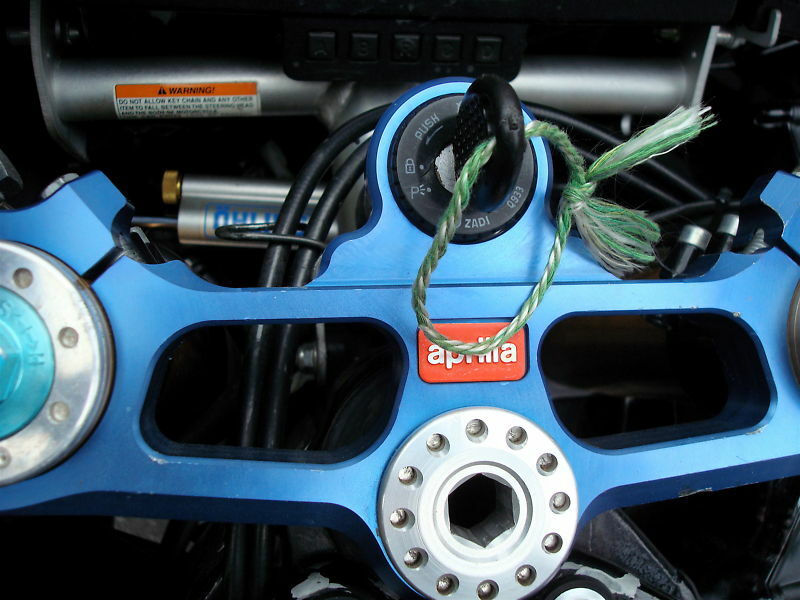 The Mille also featured a type of slipper clutch, which worked by using a vacuum on a closed throttle from the inlet manifold to give the effect of slipper clutch, but only on a closed throttle, whereas most modern examples use a ramp mechanism in the clutch basket. Up for Auction: an Aprilia Rare Colin Edwards Replica, one of 461 made world wide - street legal track bike - race kit on each machine - Rotax engine, 57-mm throttle bodies, Eprom injection unit, with racing chip - engine management, six speed close ratio transmission, carbon fiber larger air box and snorkel, Akrapovic titanium exhaust, slipper clutch, 16 tooth sprocket, four piston Brembo double floating disk brakes, Olins suspension front and rear, olins steering damper, Heli bars, OZ Blue forged aluminum Anodized wheels on Pirelli's...rides like a dream - top speed 180MPH. 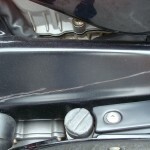 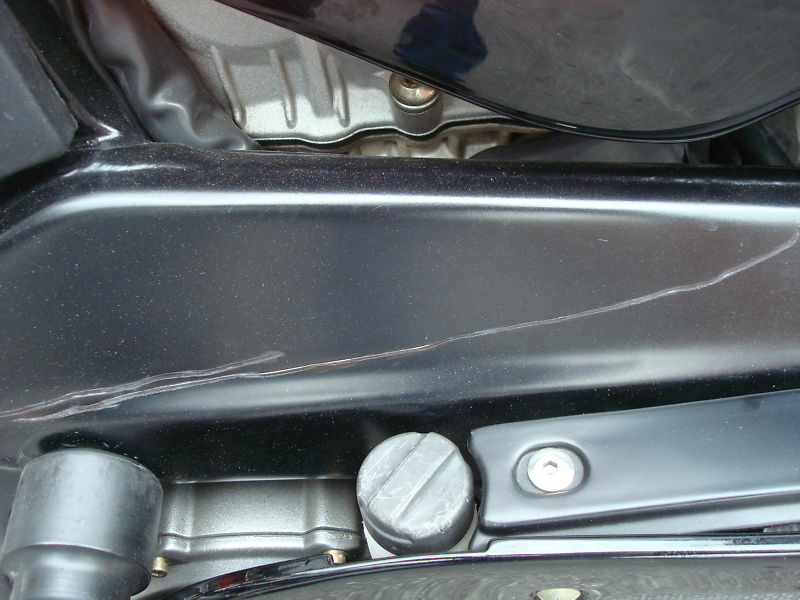 I bought the bike from a friend who spilled it with 62 miles on it, scratched it up, complained to the insurance company that parts were hard to get and they gave him most of his money back. 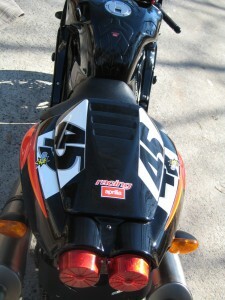 I had some panels repainted, made sure it was all straight and rode it! 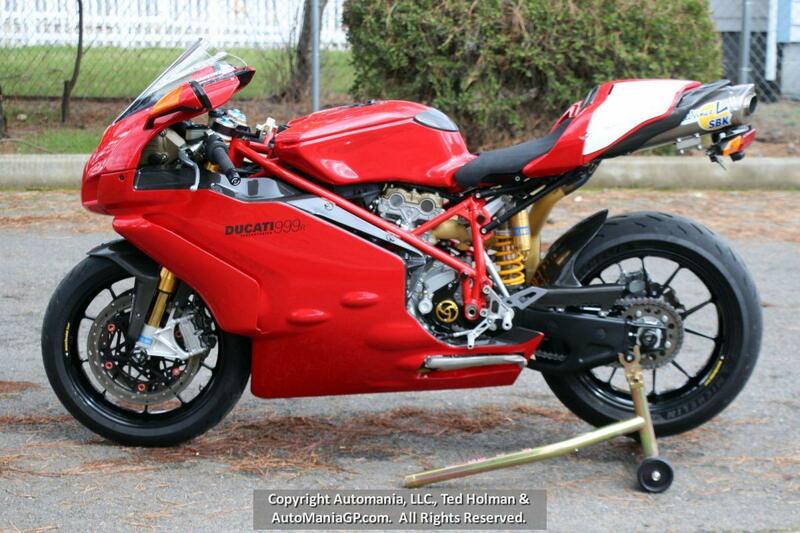 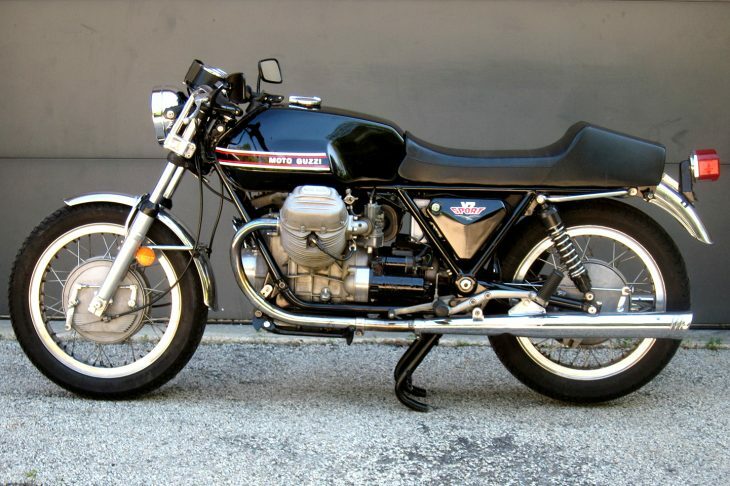 It is a wonderful machine but I can only ride one motorcycle, I hate to let it go but........ 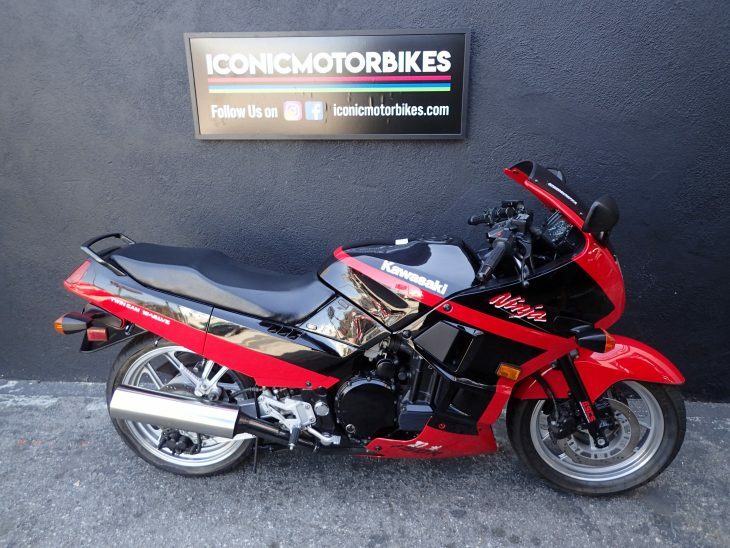 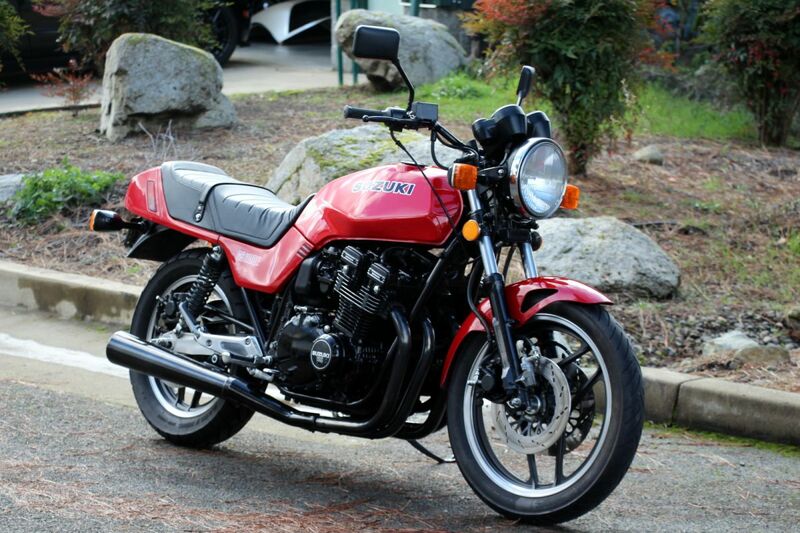 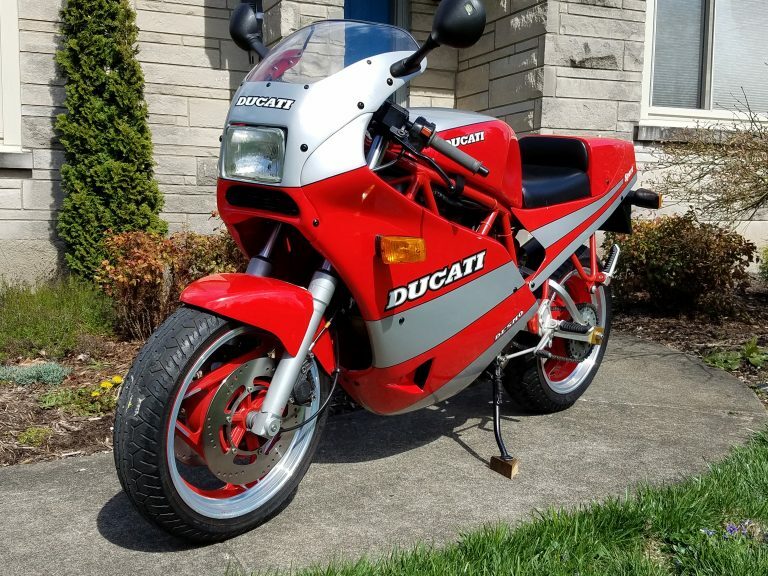 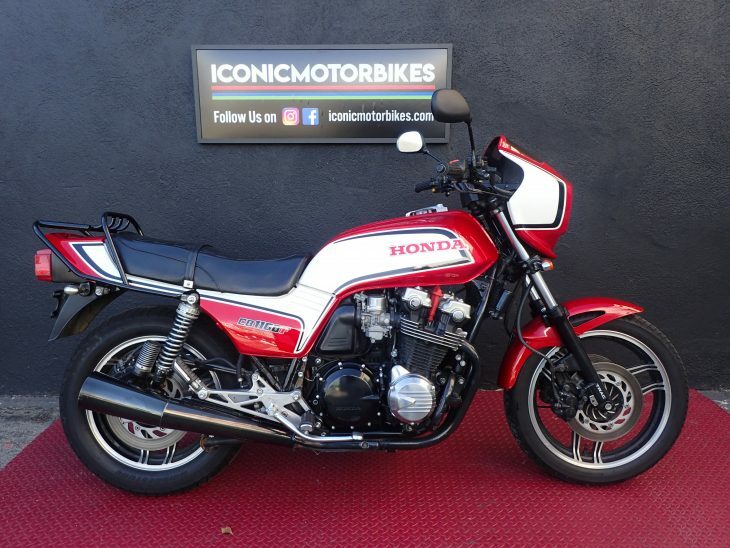 I have a low reserve on this bike, that originally sold for over $19,000. 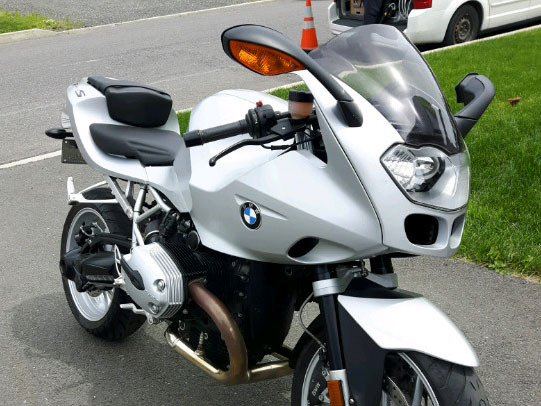 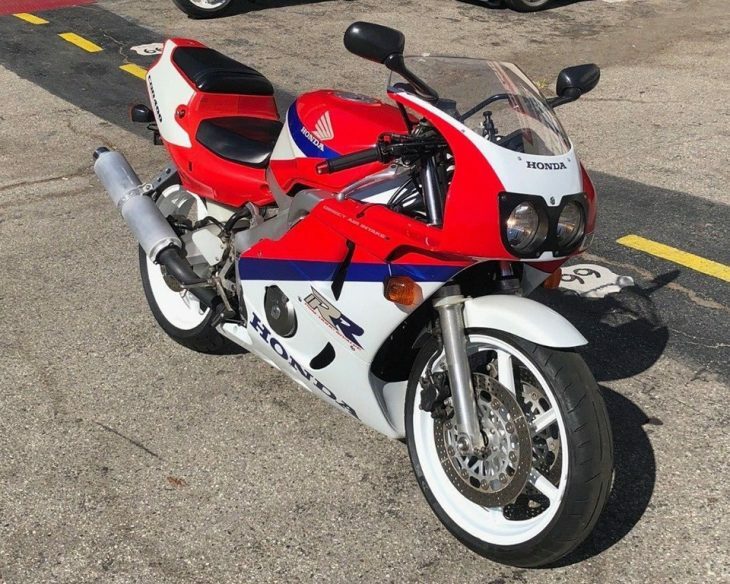 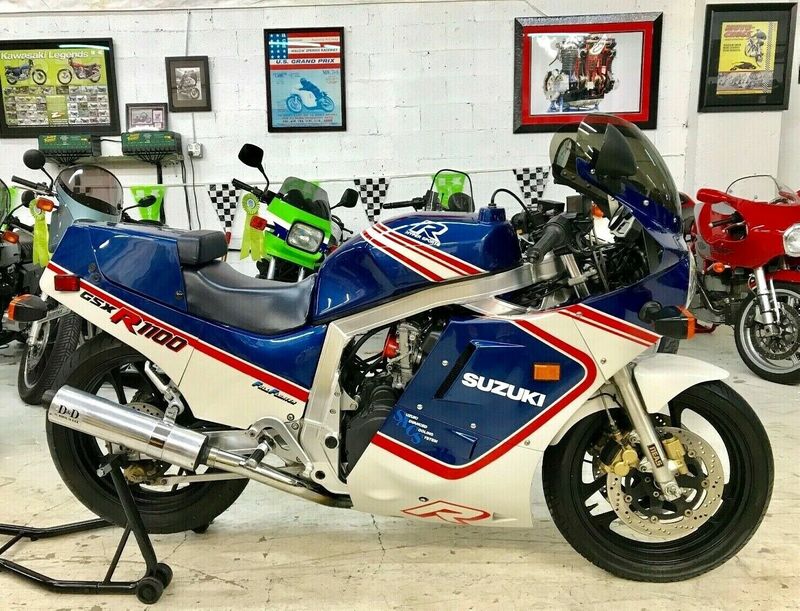 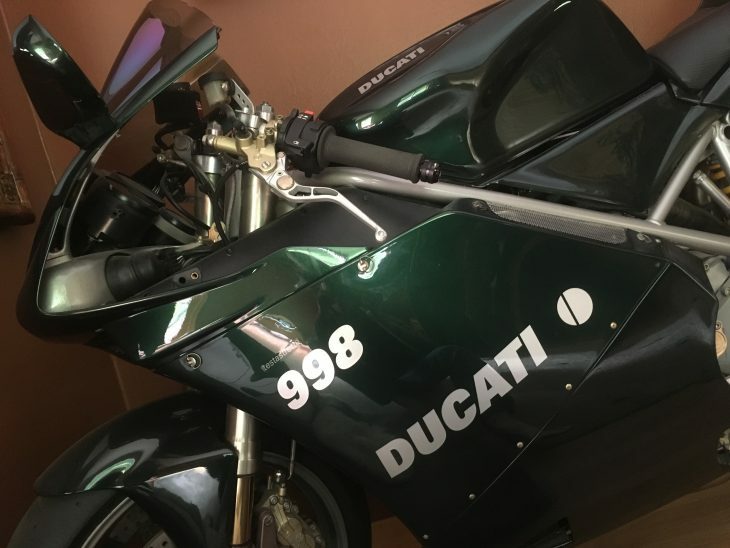 Please ask all questions before bidding, email through ebay, the winner of the auction is responsible for picking the bike up or for shipping to anywhere. 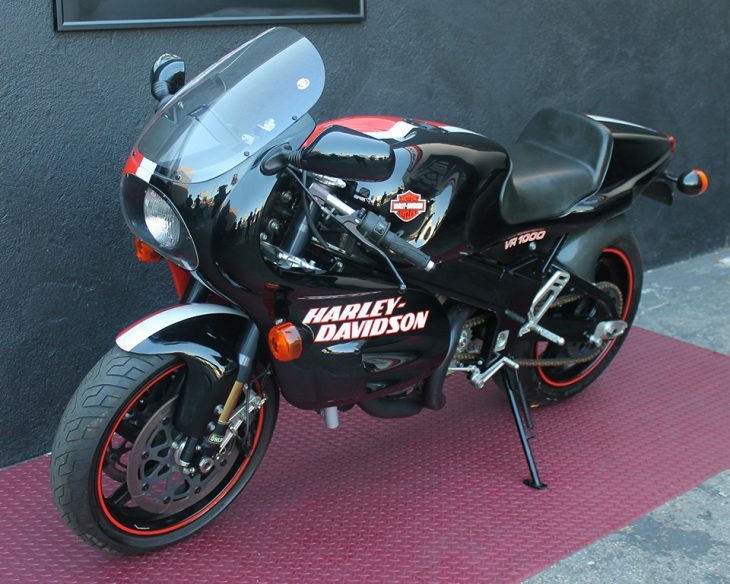 A deposit on your Master Card or Visa of $1,000.00 at the end of the auction - the rest in three days. 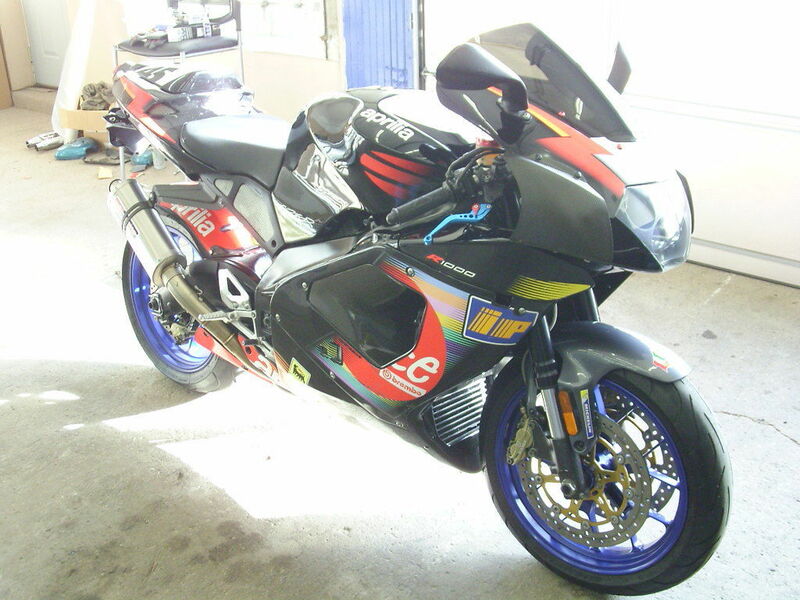 Bidders are welcome to come and view the bike in person, I tried to take as many pictures are allowed to show off the bike and also to show some of the minor scratches. 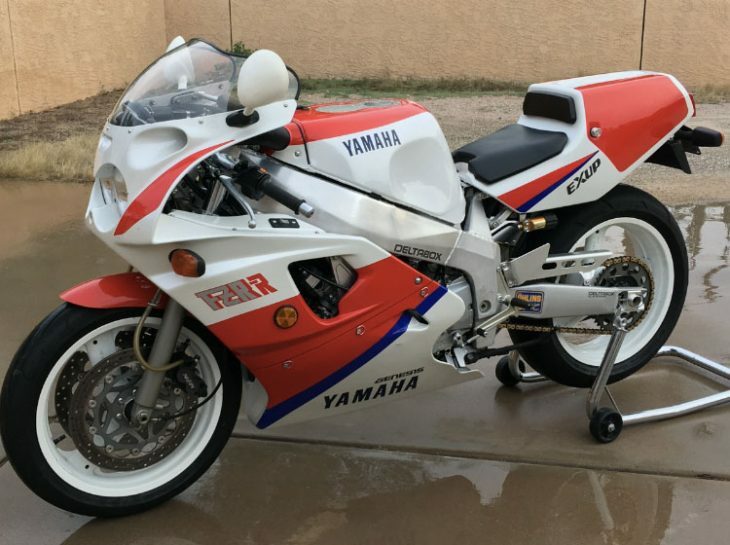 The eBay Listing can be found here. 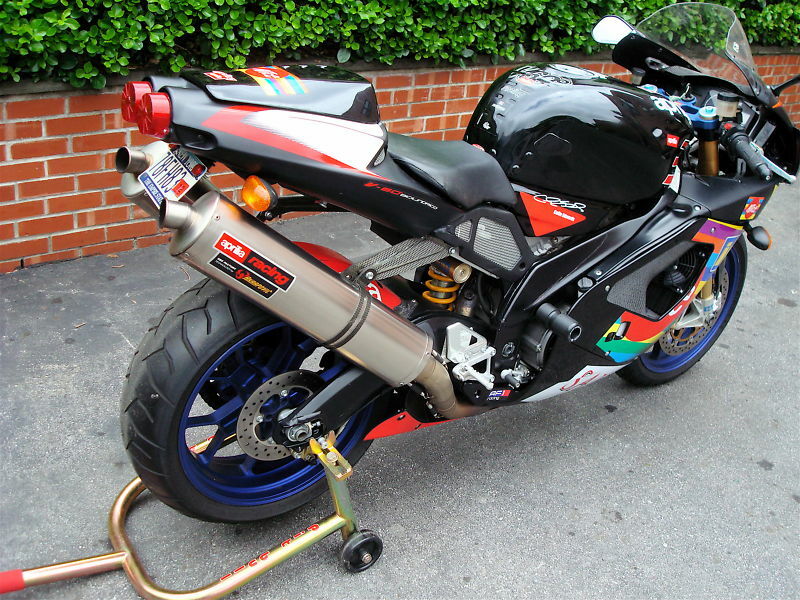 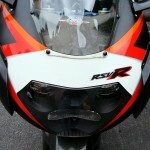 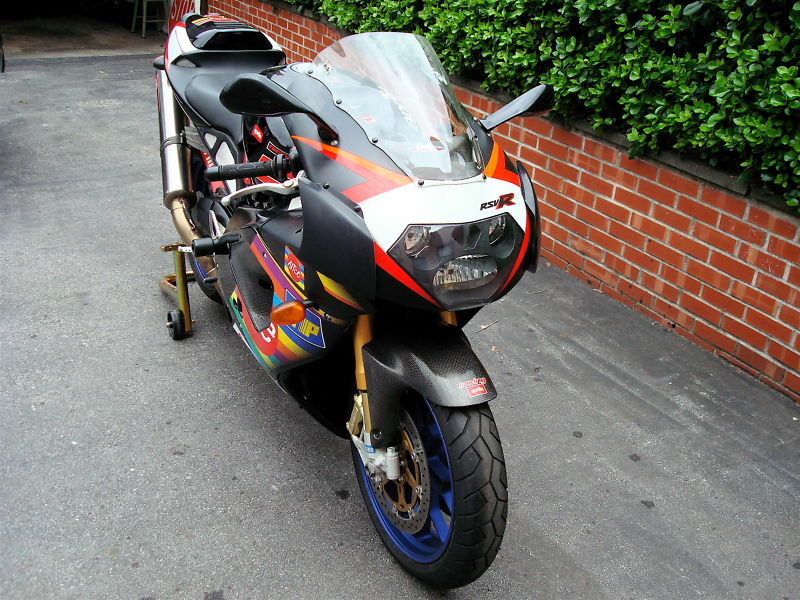 RSV Mille R's are very nice bike sand this example is rather special with a low mileage. 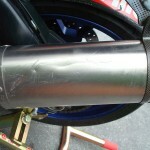 It has got a few bumps and bruises but on a bike such as this it should not be an issue. 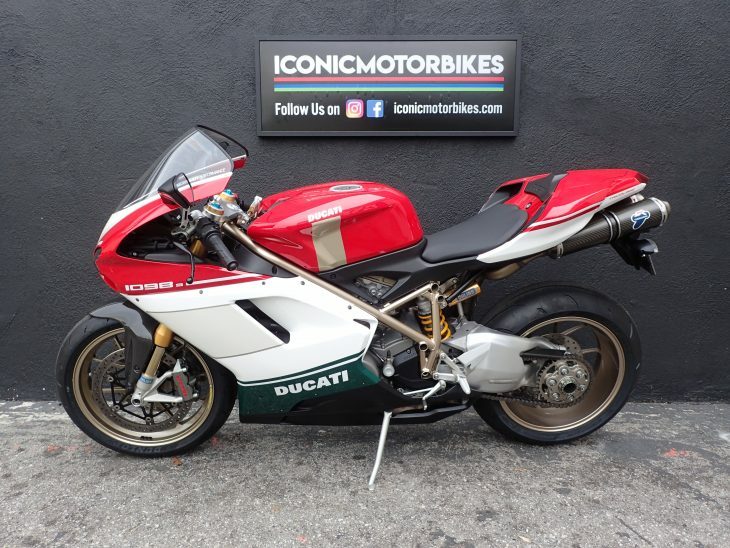 Price wise these are a bit of a bargain particularly when compared to other Italian bikes, this would seem to have a value somewhere in the $7k-$9k range based upon other examples being sold. 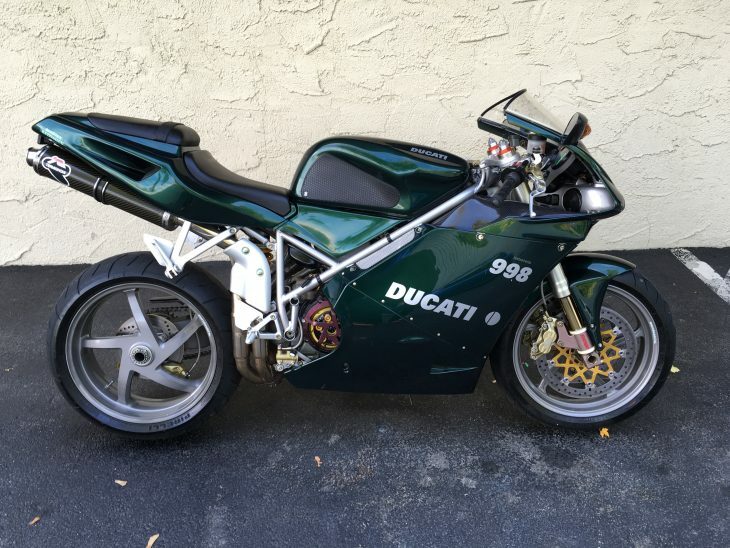 Happy bidding.